If you have any corrections or questions, please Leave a Reply at the end of this page. The Hopper 3 is a game changer. It’s a 16-tuner 4K video Whole Home DVR system. 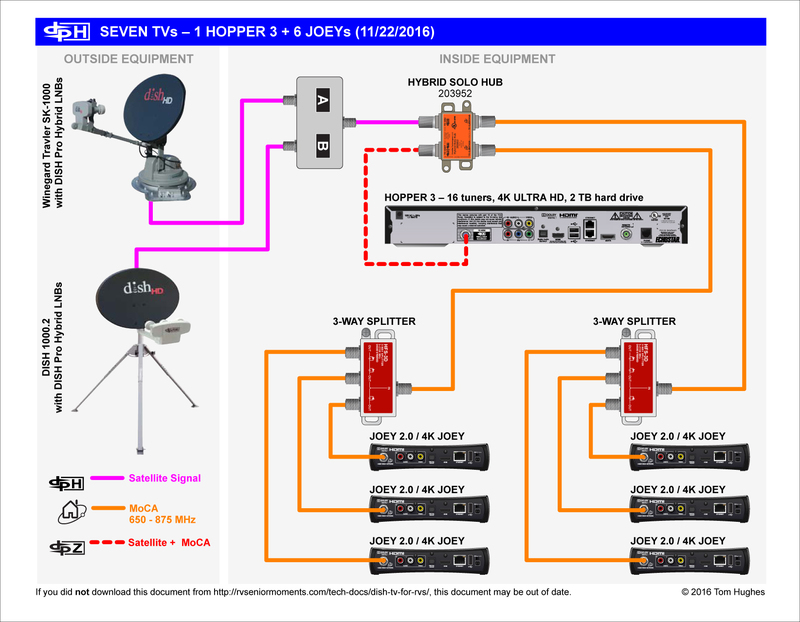 However, it requires different equipment and networking than the Hopper 1 (the original) and Hopper 2 (Hopper with Sling). 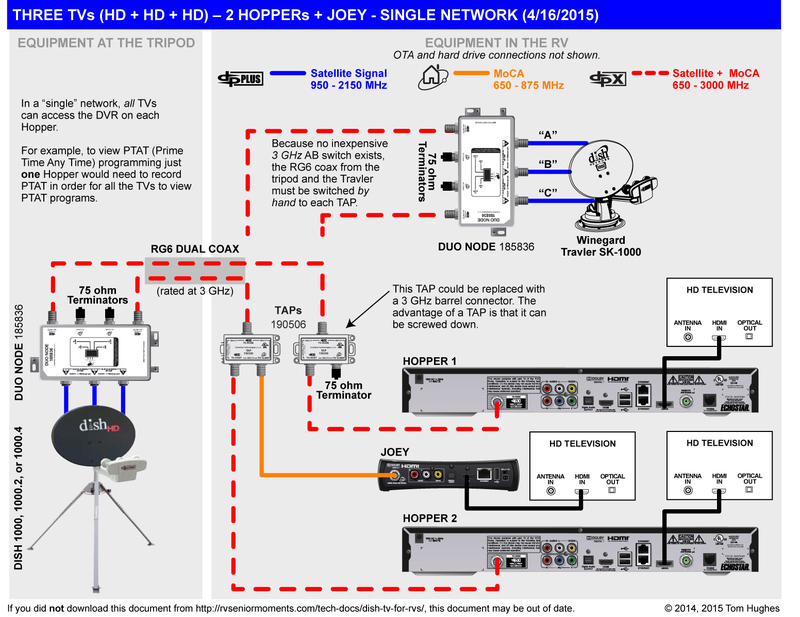 You can use the new DISH Pro Hybrid (DPH) technology with the Hopper 1 (original) and Hopper 2 (Hopper with Sling). The major advantage of using DPH equipment is that you will use less wires — an important advantage for RV DISH users. 1000 Plus Satellite Dish — typically used now to get international programming on satellite 118°. 1000.2 vs 1000.4 Satellite Dishes — a comparison of these two portable, open-faced dishes. Diplexers, Triplexers, Separators, and the Winegard G2 — options for dual-tuner DISH receivers. DISH Anywhere & Sling — remote viewing of DISH programming. 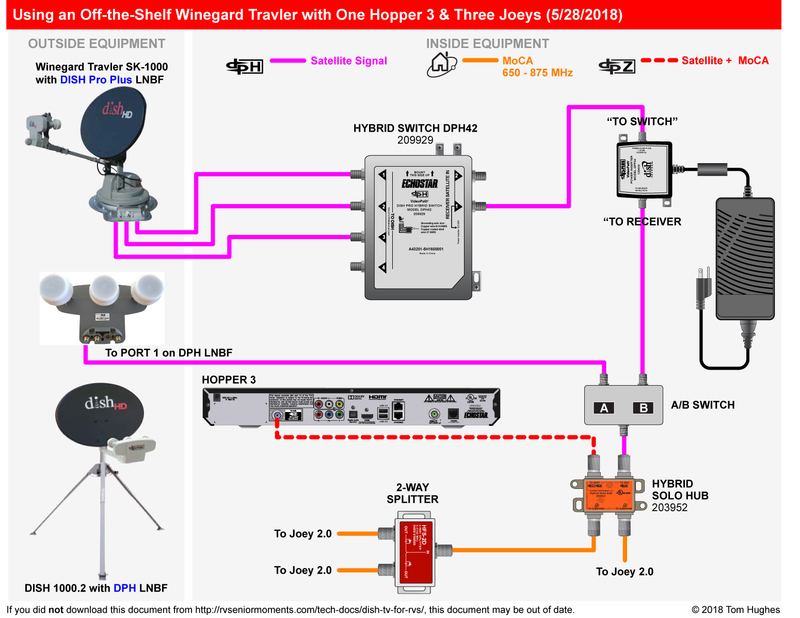 DISH Pro Hybrid Winegard Travler Upgrade — updating a Travler to work with a Hopper 3. DISH Western & Eastern Arcs — understanding DISH’s multiple satellite system. Hopper 3 & the Winegard Travler — getting a Hopper 3 to work with an upgraded Travler. Hopper 3 Activation & Diagnostics — the 1st time Hopper 3 activation process. Video Switches or “BOMBs” — the old-style way of networking TVs in an RV. Winegard Travler — the rooftop automatic dish that does it all. 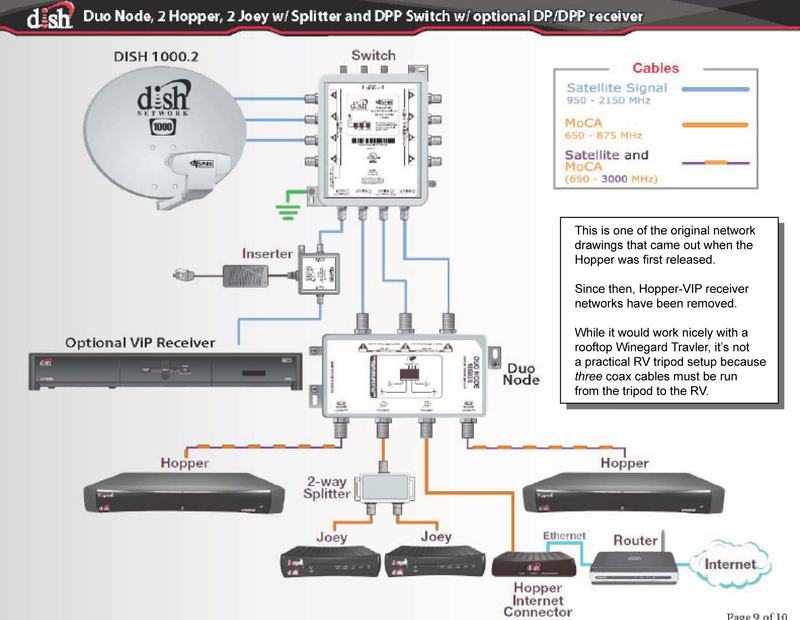 Currently DISH does not want VIP receivers (211, 622, etc) connected to a Hopper network. 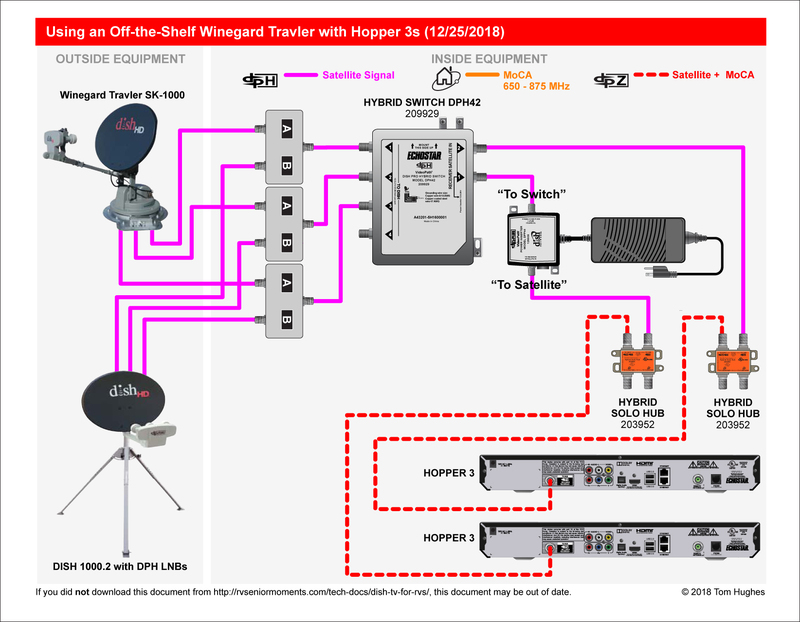 However, early Hopper documentation from DISH showed a “mixed” Hopper/VIP receiver diagram. 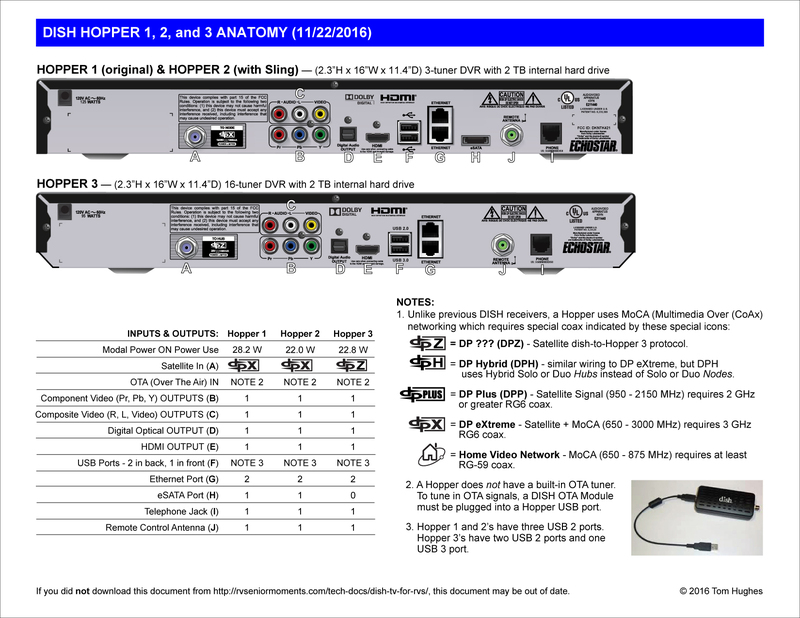 – Added Hopper 3 info. 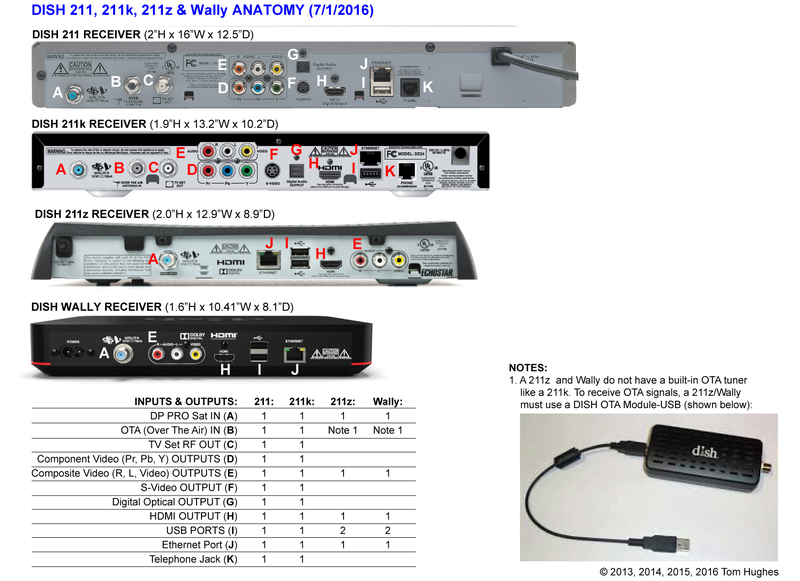 INCORRECT INFO IN DISH’S DPP44 INSTALLATION GUIDE . . . The DPP44 installation guide that comes with DPP44s had some misleading information on connecting DISH’s Eastern Arc satellites (61.5, 72.7, 77). 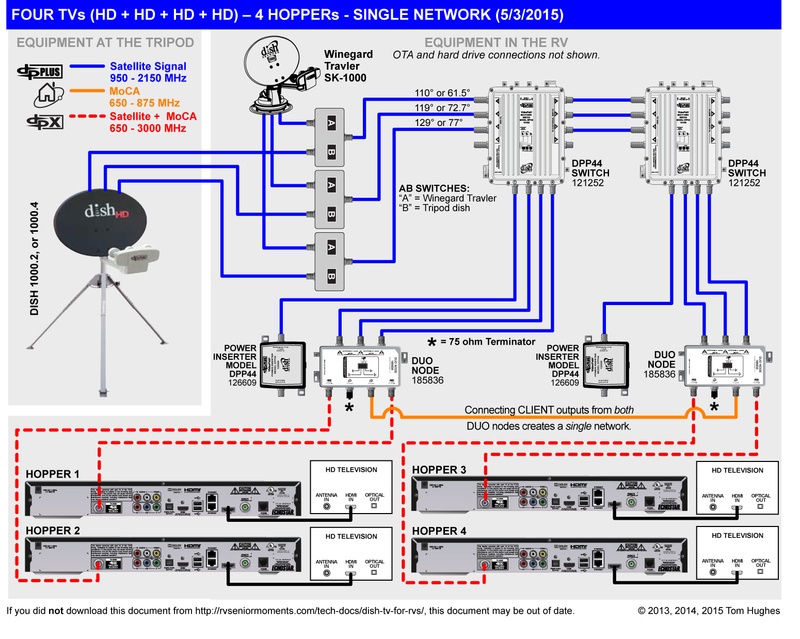 I contacted the DISH Technical Publications department and they sent me a PDF of the current (2013) DPP44 manual. They also said that the Eastern Arc information was incorrect and will be removed in a future version of the installation guide. Here is a link to the 2013 DPP44 manual with markups on the Eastern Arc info. In both of these setups, one of the TVs just “echoes” what’s on the other TV. Here is what I have, and my problems. I have a Roof Mount SD Winegard W104DE. Being in Oregon it won’t work in most camp sites due to too many tall trees, So I bought the Tailgater to get better reception. I have the VIP211K receiver. How would I set up input so I can use either sat dish. Does the Winegard W104DE allow two different TV’s or does it just mirror also? Sorry for being a nuisance. Not a problem, Bruce, but I don’t know what a Winegard W104DE is. However, I think you could use an RF A/B switch to go from the WInegard or the Tailgater. Very nice, clear diagrams. Love a pro. We have the Pay as you Go service and a 211 receiver. When i called Dish to enquire about the hopper, they said that we were unable to get it with our service. Do you know anything about this? DISH doesn’t allow a Hopper on its Pay-As-You-Go service. Someone on the Escapees forum was able to sign up for DISH Pay-As-You-Go service with his Hopper. How can I get eastern arc dish with kvh r4sl? It looks like you can only get sat 61.5. See the op manual. I go to a park for extended stays where I must get my own Internet & TV service (the pedestals are wired with cable, it just isn’t activated). I’m thinking of contracting for cable modem service for Internet and DISH TV for TV service (my RV is pre-wired for both). My question is this: Since the RV only has one coax wiring system, can I mix the two services on the RV’s coax wiring? Has anybody successfully done that? Thanks for any input. Thanks for taking the time to post these very helpful diagrams. Your information is invaluable to me as I start to outfit our new motor home. Our options have become more difficult since I wired our first 5’er with two 311 Dish receivers. During the last 5 years or so, we move one of our Dish 722’s to our rig when we hit the road. This worked OK as that 5’er had two TVs. Our new rig has four TVs and I am willing to bet it uses the older style RG-6. Mike, you’re welcome. 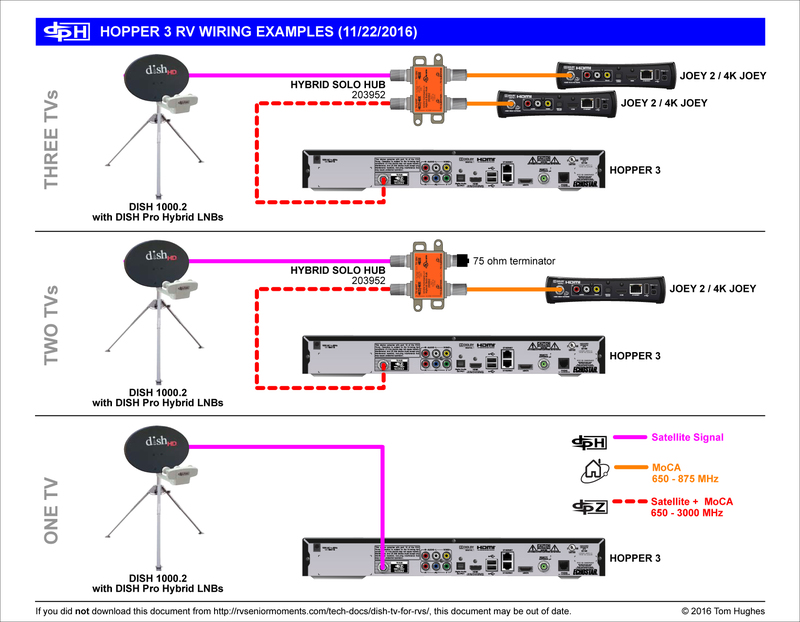 Take a look at a Hopper with the new wireless Joeys — this bypasses the whole RV wiring issue. Could you please tell me what satellite finder/meter you have found works best with the 1000.4 as it has multiple LMB’s? Thank you so much as your hopper/joey diagrams have been invaluable! I use an Acutrac III Plus which I think is no longer manufactured. However, they appear in eBay once in a while. What I love about the Acutrac is that it shows the signal strength of all 3 sats simultaneously. Are there any current market alternatives? What about a superbuddy 29? Talked to some dish guys today and that is what they recommended? For about $700 it better be good. Yeah, I see the price diff. You can get them on ebay for 375 though. The other alternative was a birddog ultra until you brought up the FS meter, so it was similar in price. I will read up on the FS, does it read all 3 sats at once? I think the Acutrac III+ is the only meter that can display 3 sats at a time. Thank you for putting these very helpful documents together. We are very new to RVing / Fulltiming and have had some challenges that we have been able to overcome with the help of folks like yourself providing great information. We have a Dish SK1000 with a Hopper and have recently arrived in the eastern US (currently NC). Previously we had contacted Dish to have our service address changed but they are now suggesting that we switch to eastern arc sats. I am ok with that but not sure if the 1000.4 supports that change. Do you know if it does or not? Also, if DIsh changes that settting will I need to make any setting changes to the SK1000.4? As you know the Winegard SK1000 is an automatic roof antenna. The 1000.4 is a portable dish that must be manually set up on a tripod. Your Sk1000 is a Western Arc dish. This just means that it can acquire DISH sats 110, 119, and 129. These sats are readily accessible in the Western US. The 1000.4 portable dish comes standard as an Eastern Arc dish. It can pick up sats 61.5, 72.7, and 77. You should also probably get a good sat meter. I think a VIP 211 might work, but the AS2003 is an older unit. You should give Winegard a call. Thanks for all the great info… BTW I really like the URL! We are new to RVing and have recently purchased a used MH with four TVs. We plan to eventually go full-time, we are about two years out from making that leap. After reviewing the various four TV setups you provide, I have a couple of things I am unclear on. 1. MoCA connections/cables- can it be RG6 or?? What is preferred or required? I’d like to just run RG6 everywhere, is that advisable? 2. 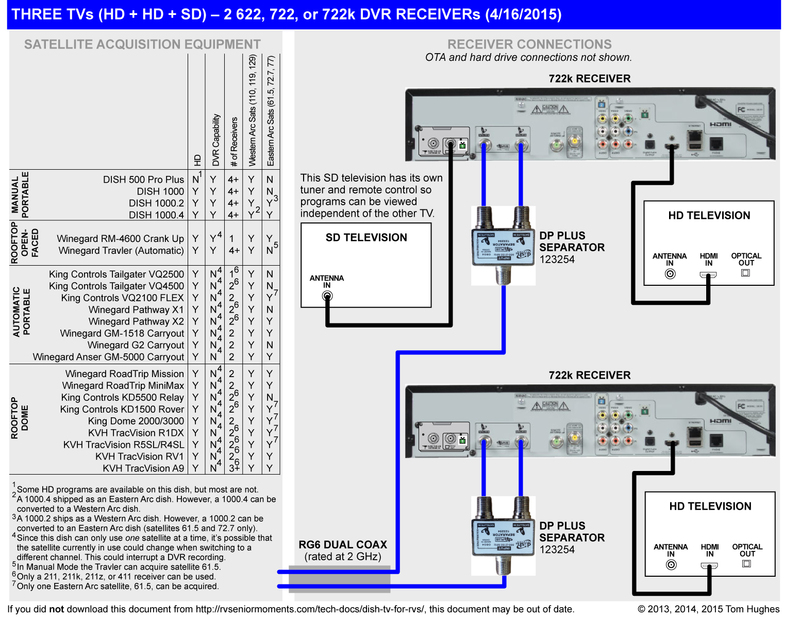 We currently have two VIP722 DVRs, could we connect them to the Trav’ler via two fo the three connections and then provide simultaneous independent SD programming to two fo the four TVs? 3. In the various 4 TV configurations that you provided, and you annotate the listing with “(HD + HD + HD + HD)” does that annotation indicate that the configurations provides simultaneous and independent HD programing to four TVs? 4. 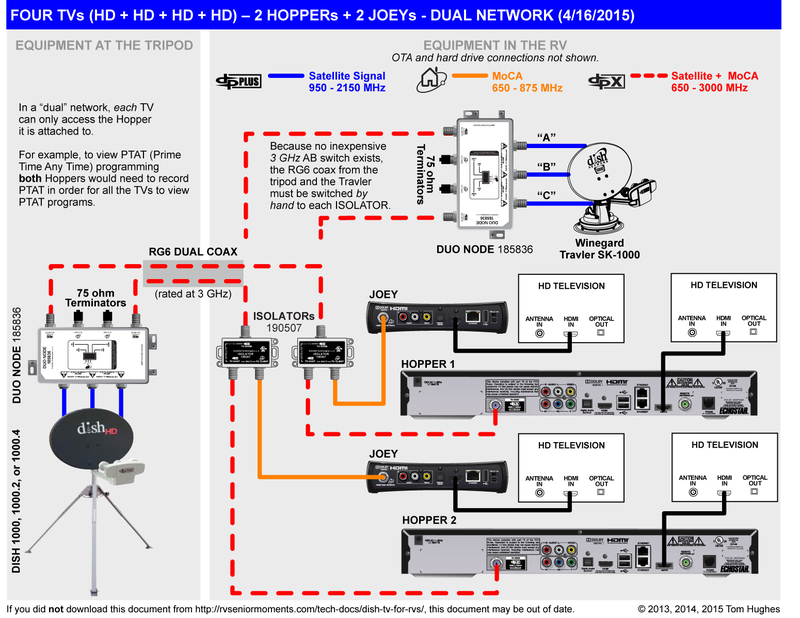 Is there a configuration with the WINEGRAD trav’ler SK1000, (no additional antenna) that I could receive simultaneous and independent HD programing to four TVs? If so could you direct me to it? Thanks again TOM for all your work and assistance. It sounds like you plan on rewiring your RV before you start full timing. That’s a great idea. While you could probably get by with the existing coax in your MH, running new cable will give you more options. 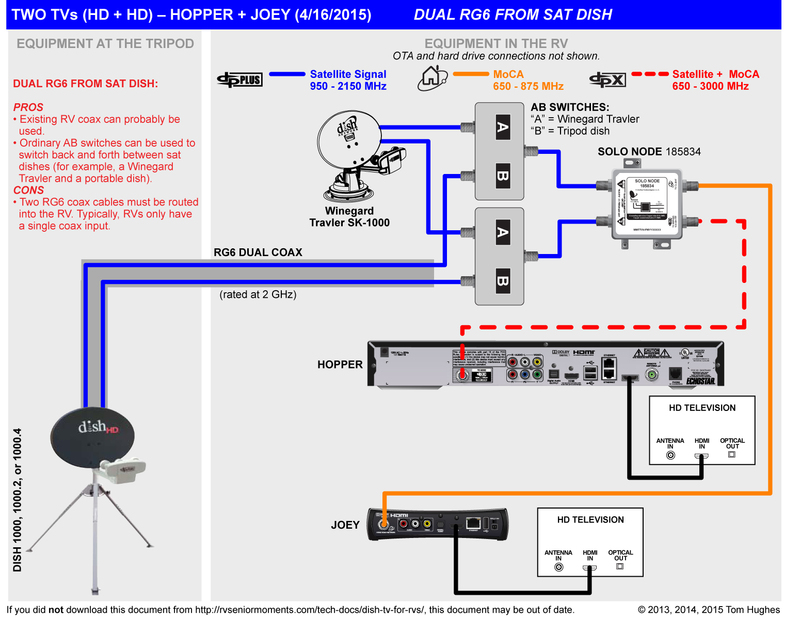 For example, like using DISH’s Hopper/Joey system. 1. MoCA cables can be RG59, essentially “bad cable” because it doesn’t require much bandwidth. But, like you suggested, I’d encourage you to only run 3GHz RG6. Why? It will give you a lot of options, like being able to use two (or three) Hoppers in your RV. 2. 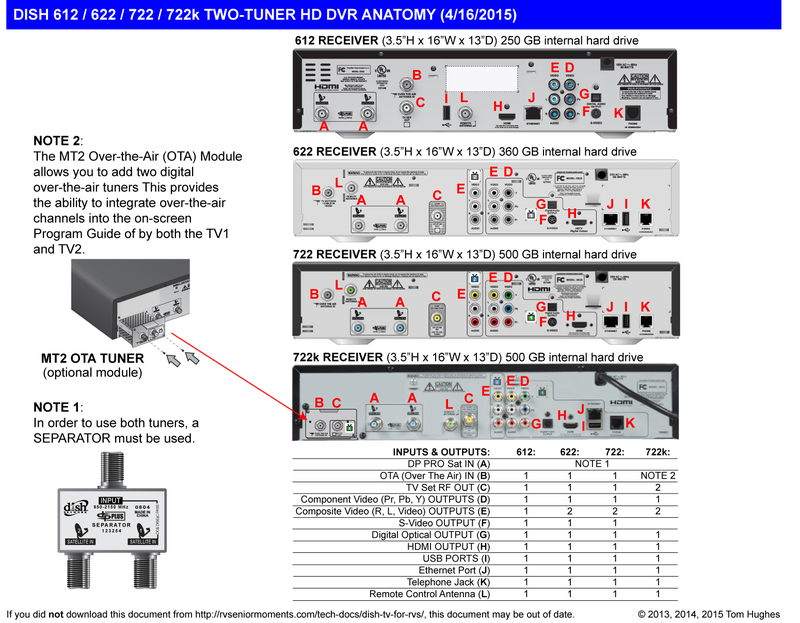 With two VIP722s you can connect up to 4 TVs, each of which would have its own remote (and independent programming). Two of the TVs could be HD, but the other two would be SD. See this drawing: Three TVs (HD+HD+SD). However, in your case, you’d connect another (fourth) TV to the 2nd VIP722. — I switched from 1 Hopper to 2 Hoppers because of the extra 3 tuners + another DVR hard drive + redundancy if one Hopper fails, there’s another one around. Thanks for the reply and the advice. So I called DISH. 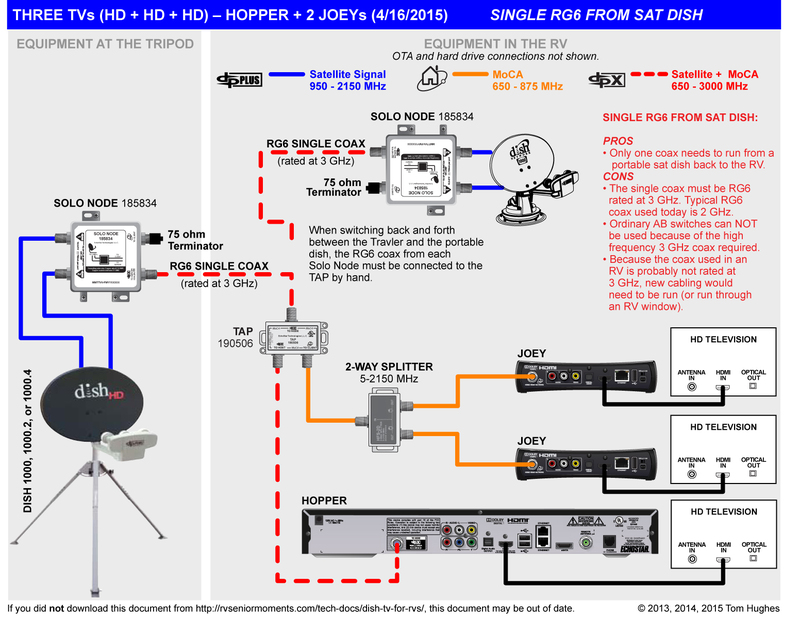 Apparently being a DISH customer for 15 years counts for something as they are providing me a Hopper with Sling, two Wireless Joey’s and a Super Joey, plus a $40 a month discount for the first year… all installed here at our home and no contract commitment. So my thought was that will be easy to move from my home to the coach, I hope I am I correct. I was wondering if you help me. I just got the dish sling and hopper with(2) joyes. I have an rv and I couldn’t get them to work. It seems the sling is a master control. Can you tell me if and how this can be done. I am about to buy a new MH, last one I had was 30 years ago! I have Dish at home (Hopper) and a couple of Joeys. I believe the coach I am considering most has 3 TV; bedroom, main cabin and outside. I can buy the devices and my dealer said they would install them. My question is how do I deal with Dish on the service needed? Work with a local sat installer, not DISH directly. Since your MH dealer will do the wiring, call around until you find a local installer who will “activate” your Hopper system. Is there a brand name or company that sells the RG6 (MoCA 2.0) coax cable needed for a DISH Hopper systems. Thanks. I believe MoCA 2.0 (as well as version 1.1) are both designed to operate over ordinary (i.e. not-so-good) household cable. The only special cable requirement for a Hopper system is the 3GHz RG6 cable between a Solo or Duo Node and the Hopper. However, if you’re up for a big re-wiring project, then redo your whole RV with 3GHz cable & never worry again. Tom – I really appreciate all of the work you’ve put into gathering the information available on your site. I’m ordering my motorhome next January and am looking for a place to start. I really wish it was possible to have a huge flowchart where I could just follow it and answer questions. In my setup, I know that we’re going to have 4 TVs. 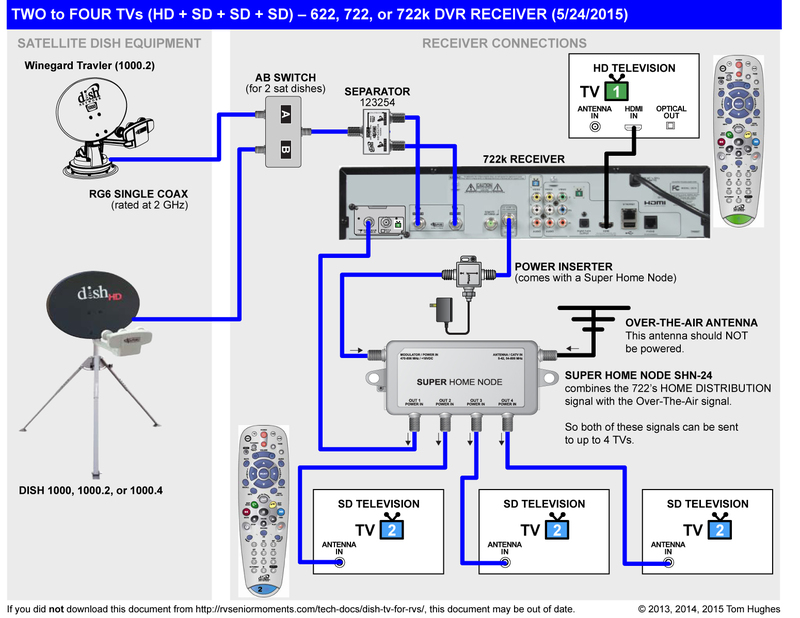 I am fine if there are two receivers such that a receiver’s output is shared (split) between two TVs. I would like DISH network – based on a lot of reading. 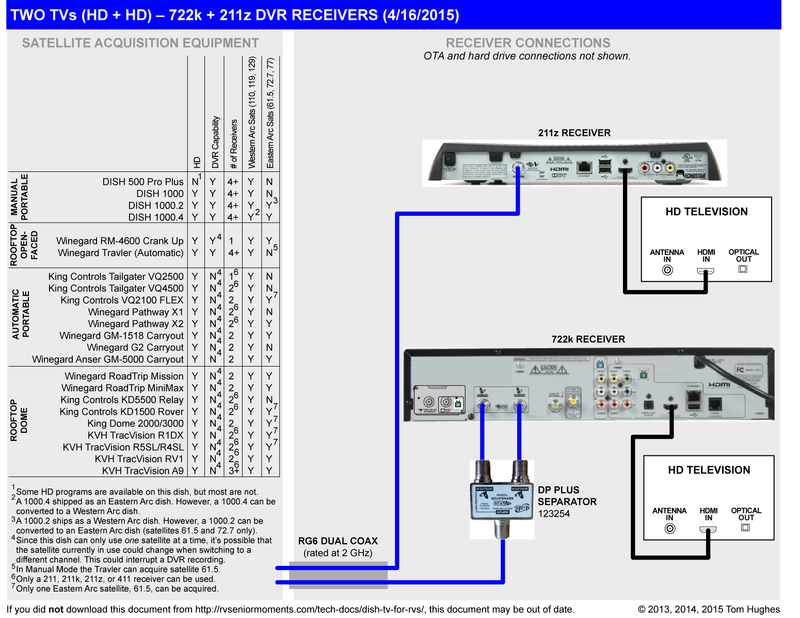 We’d like to have DVRs with each receiver. I’d like to have a dish on the roof that automatically raises, finds the satellite(s) and feeds both receivers with HD. Then, if we’re under trees, I’d like to have an optional 2nd tripod-mounted dish with about 100′ of cable. With all of the receivers, options, etc. I have no idea where to begin. I’m also wondering how we’ll change channels from the back bedroom or outside when the receivers are both in cabinets at the front of the rig. Any suggestions (equipment, dishes, receivers, configuration) you could make would be immensely appreciated. 2 Hoppers and 2 Joeys. You could also use 1 Hopper with 3 Joeys or 1 Hopper, 1 Super Joey, and 2 Joeys. 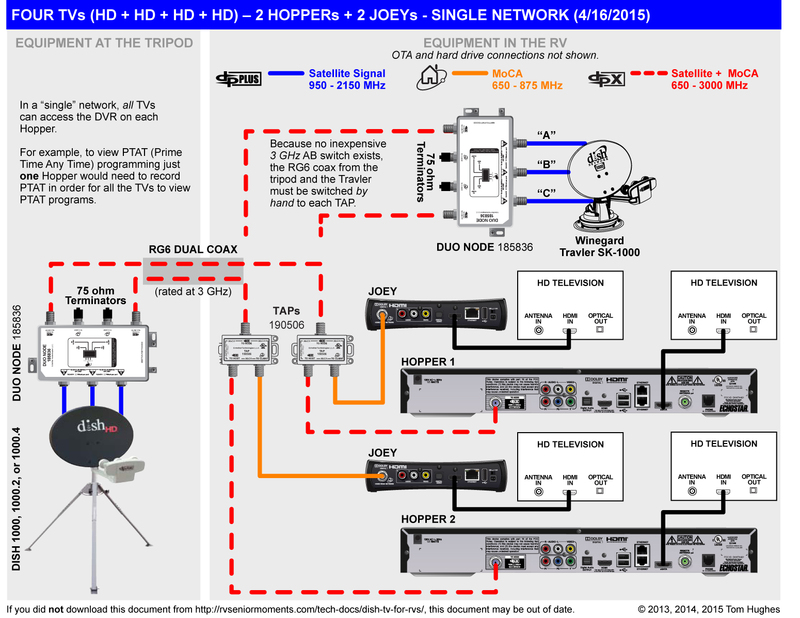 However, 2 Hoppers (w/2 Joeys) gives you 6 tuners which you may definitely need with 4 TVs + if one of your Hoppers goes South (and sometimes they do), you’ll still have another Hopper. 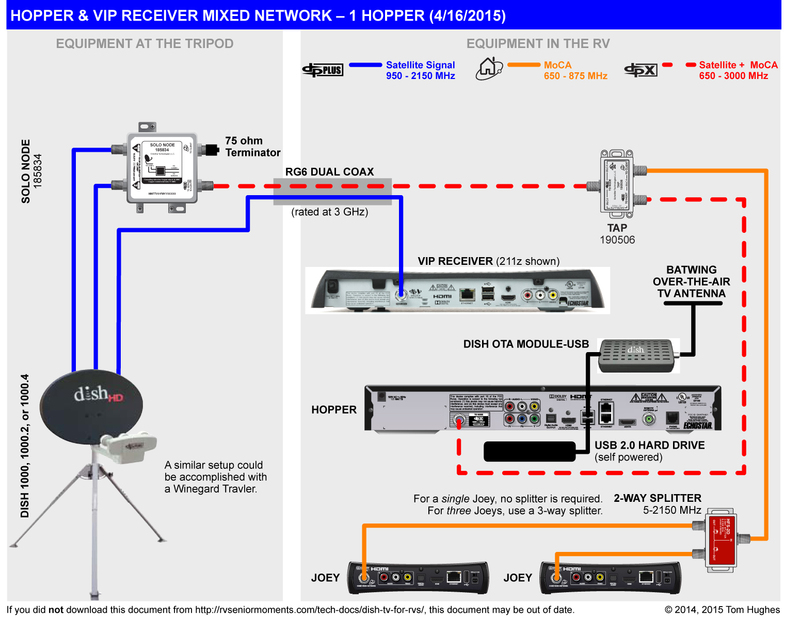 This system allows any TV user to watch recorded shows on either Hopper (which is essentially a networked DVR). Also, with 6 tuners each TV user could be watching a separate program. Winegard Travler SK1000 rooftop automatic dish. A portable 1000.4 dish with a set of Western and Eastern Arc LNBs. A 1000.4 comes with Eastern Arc LNBs so you’ll have to buy the Western Arc LNB. All of this (1000.4 dish + Western Arc LNB) can be had on eBay. 3GHz RG6 Cable. This is dual cable — you would cut off 100′ or so to use for your portable and use the rest for wiring your RV. Most likely you will not need all of the remaining cable, but buying RG6 in bulk is cost effective. Note that someone will have to add the connectors to this bulk cable. However, you can purchase RG6 in set lengths with connectors — Broadband Utopia. Finally, who will install all this? You? Local DISH installer? Your motorhome manufacturer? I’m thinking of having Newmar install the wiring and the rooftop dish, then having Dish install the receivers and the extra tripod-mounted dish. Thanks for your thorough answer. I’m writing your list into my “order” spreadsheet so I’ll know what to do. Our order date has moved up to October this year (2015). Thanks for all the great info. My husband is thrilled that I found you and your site. My question is when you call DISH to turn off you house system (in sold status) is DISH use to FT RV’ers that want to use a Hopper and Joey? Are they use to RV’ers calling to change locations too? When we bought our Tailgater holy cow that took several calls before we got someone who knew what we were talking about. Hope I didn’t miss the info somewhere on here. Sorry if I did. As you’ve already discovered, DISH is pretty clueless about RVers. If you’re installing/moving a Hopper system in an RV, I suggest you try a local satellite TV installer. You may have to try a couple of them as they are also not nuts about RV installs. In fact, the more YOU can do (like wiring), the better. Regardless, use a local installer instead of going direct to DISH. Yes, we call DISH (or use their online chat) to change our Service Address when we move out of range of the local TV stations. Lots of folks do this. Most of the time it works like a charm. Thanks so much for your response, that is what were thinking but not sure of either. Thanks so much for your help! 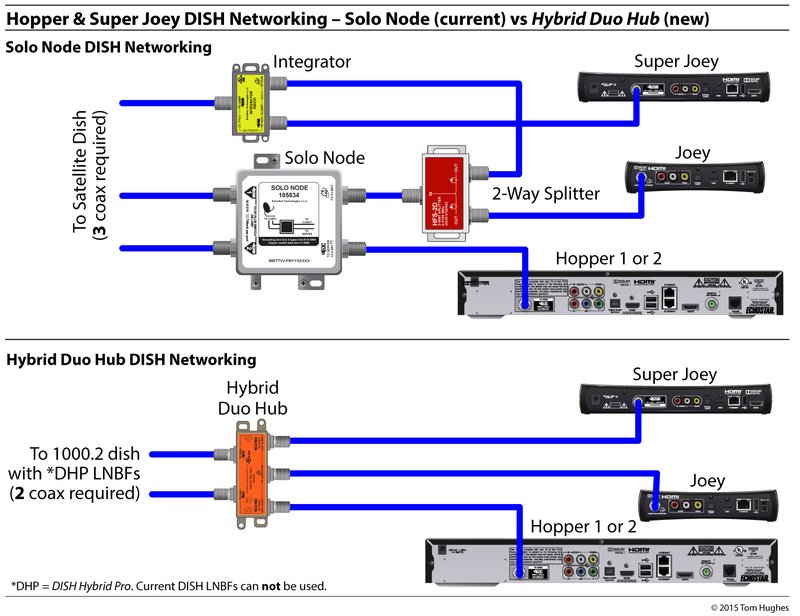 I am switching from a 1 hopper/1 Joey configuration to a 1hopper with sling/1 super Joey configuration. 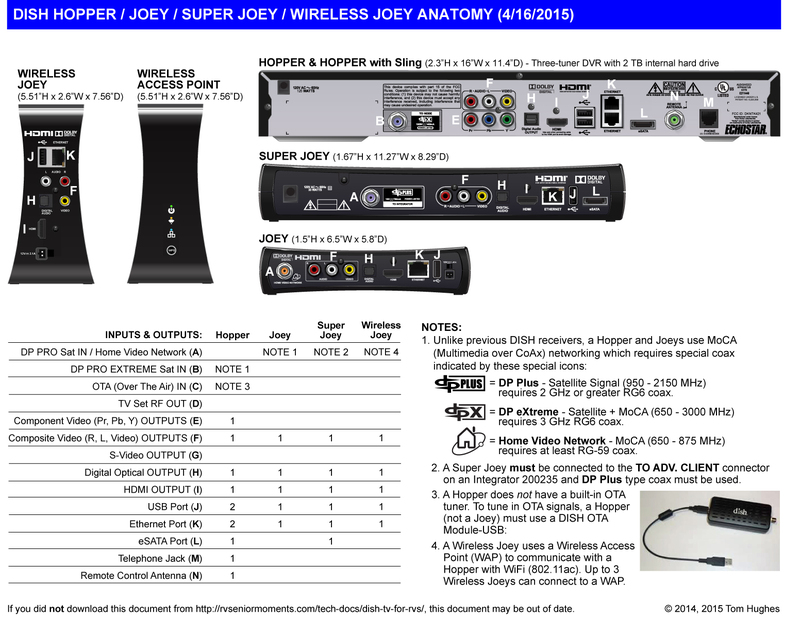 I see the need for the integrator (200235) for the Super Joey but do not understand the need for the Tap (190306). 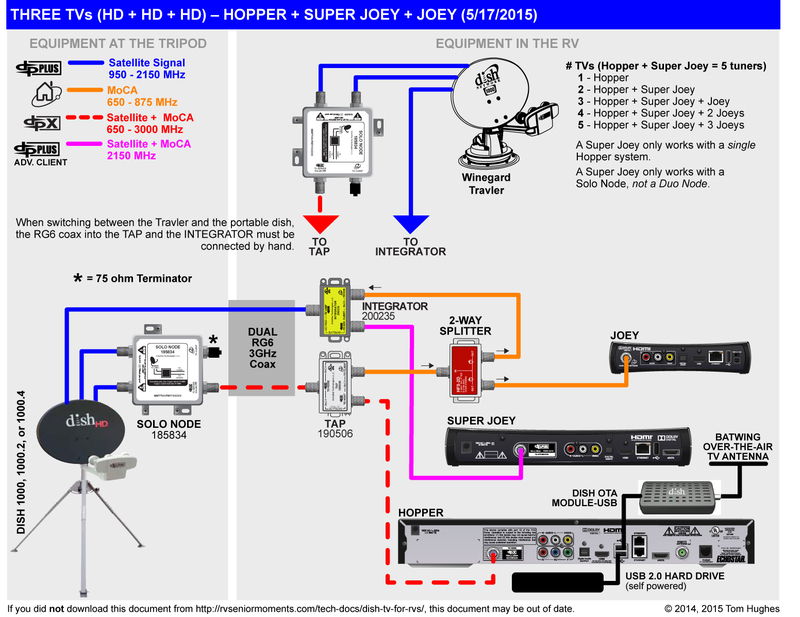 The other Super Joey diagrams I see have the Solo Node remain the same and the Integrator Client port connect tot the Moca Splitter. 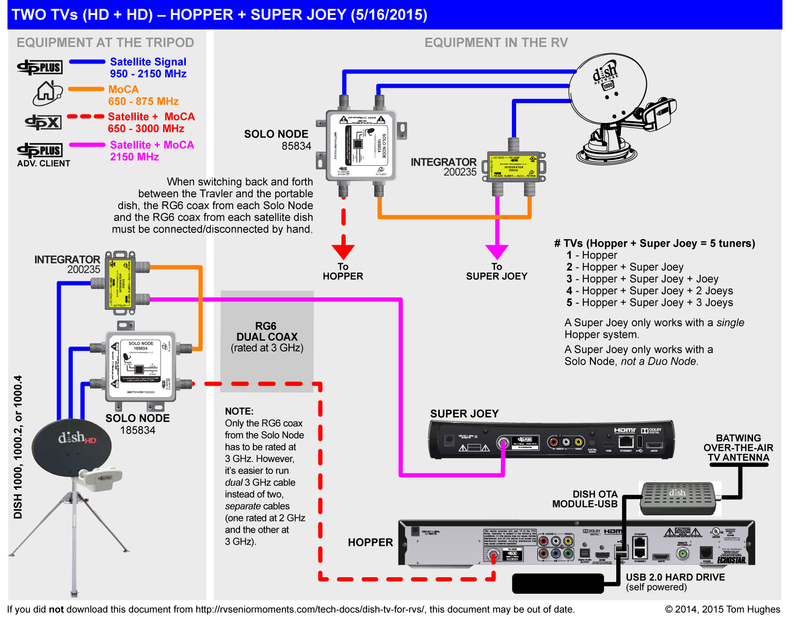 Yesterday I ordered the Hopper/super Joey/Integrator. I need to know if I need to order the Tap. You don’t need the Tap if you’re just using a Hopper and a Super Joey. The Tap is in my diagram when one or more Joeys are also installed. Otherwise, w/o a Tap you’d need 3-4 lines running from portable dish to the RV. I should probably create a separate drawing for just your situation. 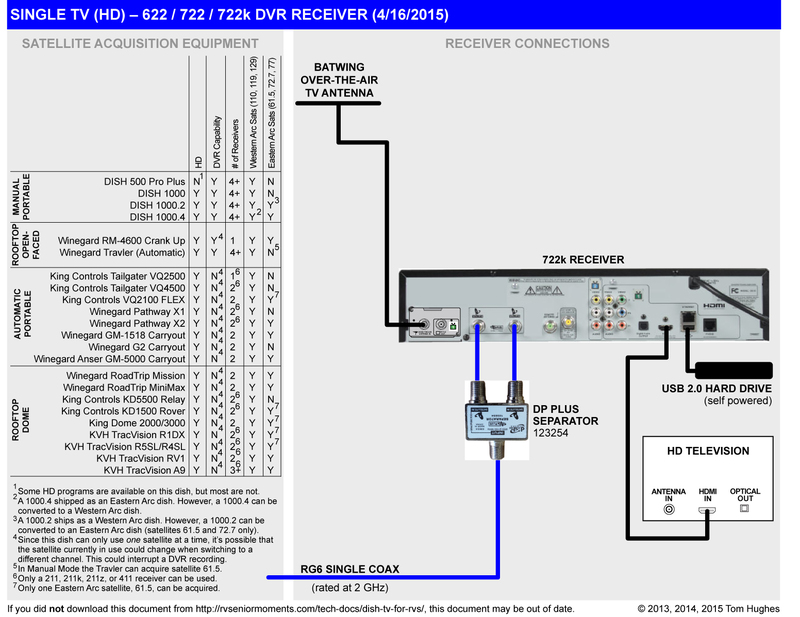 The only DISH receiver that will really work with a Winegard Pathway X1 or X2 is a VIP211. For a Hopper/Joey you would need to use a rooftop Winegard Travler or an open-faced portable dish like the 1000.2 or 1000.4. Tom! Help! See my post yesterday on irv2 about my frustrations with DISH (http://www.irv2.com/forums/f103/frustrating-day-trying-to-get-dish-network-info-261589.html). All I want to do is take your advice and have DISH – or someone – come install the Hopper & 3 Joeys in my RV. Also need an external sat. dish. Don’t know who to call to purchase. It’s sounding more and more like I’m going to have to order it for my house and then move it to the RV! I replied to your post on irv2, but . . . If you have a house AND an RV, you can only have a Hopper/Joey system in one of them — unless you plan on moving the Hopper and Joeys back and forth. People do it. It’s just a PITA. Thanks – again! I guess I missed that irv2 post. But that certainly confirms what I’m thinking. Looks like I may end up with a Tailgater, two 211z’s, two RF-to-IR extenders, two external hard disks and a bunch of splitters! Hello. Great site! I am about to start up a new house DISH service with a Hopper and a Joey. For our RV, we own a Tailgater and 211k. 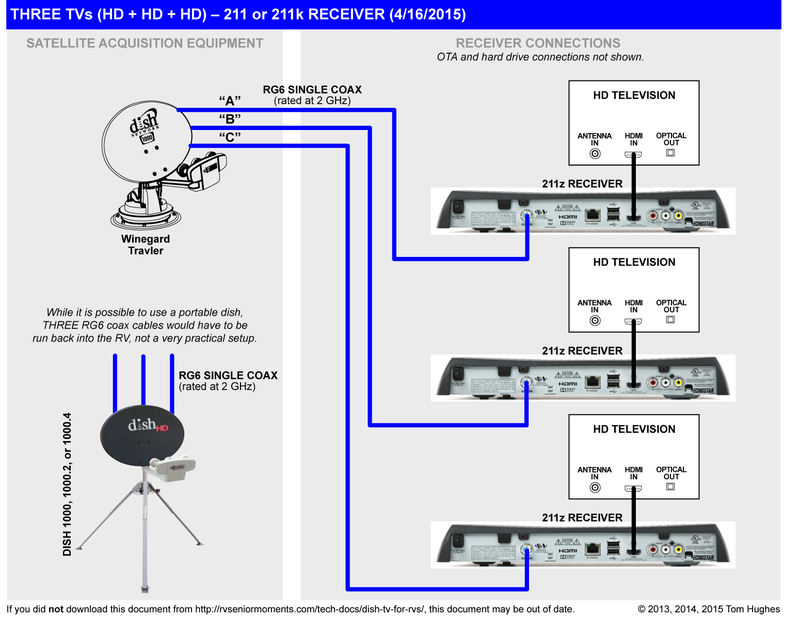 I asked DISH via chat if the 211k can be hooked up for a 3rd TV at home, and they said no. I see your diagram for the Mixed system. Do you have any knowledge about the current state of affairs regarding a mixed system? The guy said they could add the 211k to our account, for use in the RV. Do you think an installer could follow the diagram and connect it on our new house system? I guess the questions are 1) will it not even work off the house dish, and 2) if it is technically feasible, and I’m paying $7 per month for it, can an installer connect it? Hope I didn’t confuse anyone there…. As an additional question: If it is feasible but DISH doesn’t support it, should I just start the account and then see if the installer will activate the 211k when he shows up? Or should I go through a reseller or some kind of independent installer? Not sure how to find one, but if I have to do so, I will. My guess is that an installer won’t do it — of course that doesn’t mean you can’t ask. 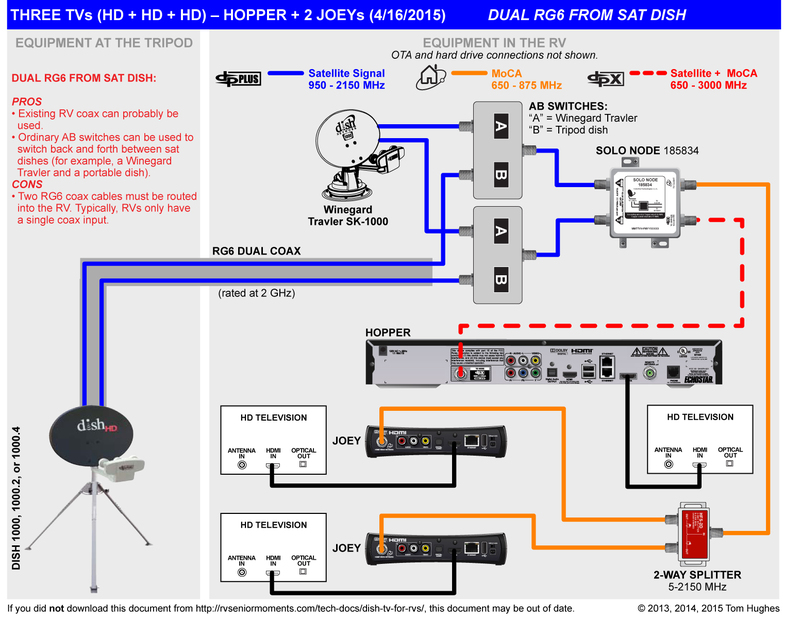 However, if you have a Hopper & Super Joey or two or more Hoppers, it will not be possible for the installer to connect a 211 unless two sat dishes are installed. Tom, Awesome site! I wish I had looked at it before I ordered my coach with the RTT-40B. 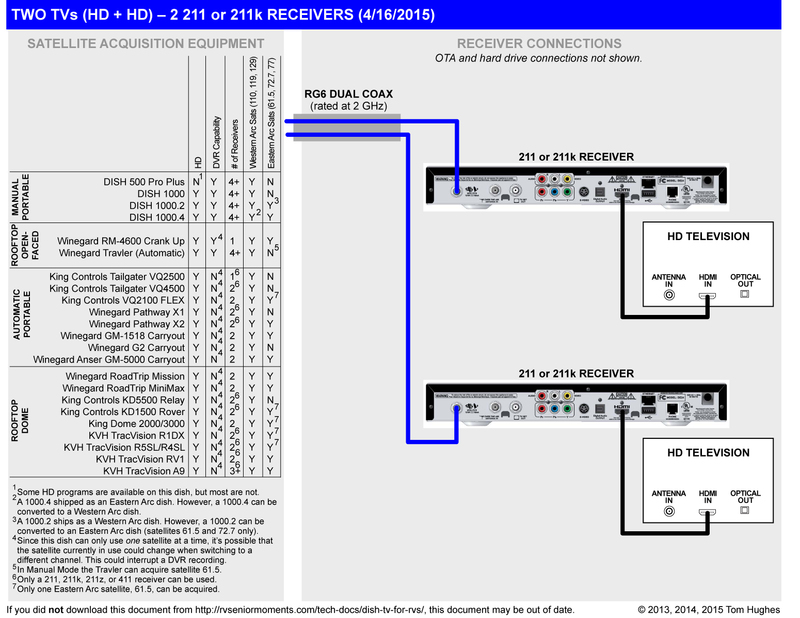 Be that as it may, I have two VIP 211z receivers. 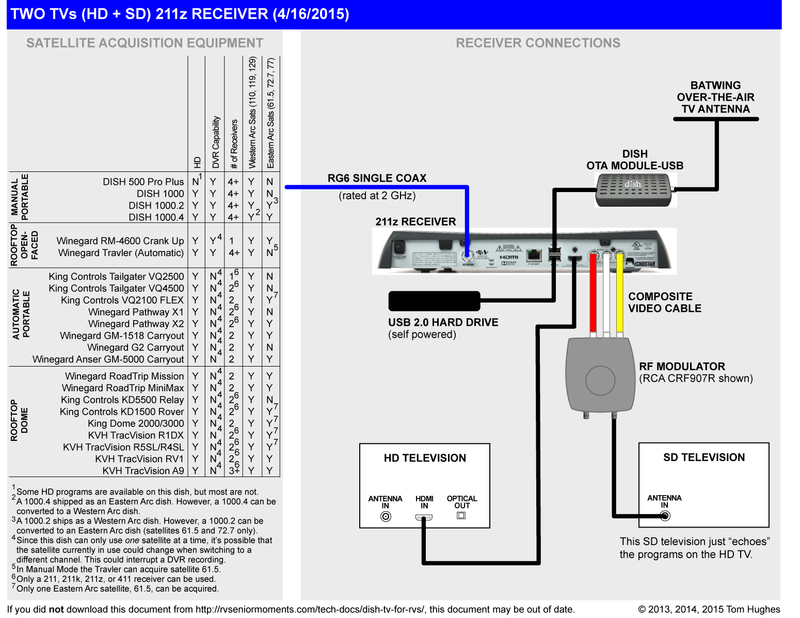 I added a USB SSD 2 TB HD to the front receiver and called Dish to activate the DVR. No problem, everything worked well. A month went by and the wife wants another DVR in the bedroom. I bought an identical SSD 2 TB HD and called Dish to activate the second DVR. The bedroom DVR would recognize it, but would not stop and ask me to format it. I switched it with the front DVR and with the front receiver I was able to format it for Dish DVR and it worked just fine. I tried the front DVR which had programs already recorded on it with the bedroom receiver and I was able to call up the DVR menu, but no further. I was not able to pause or FF or any other DVR functions. 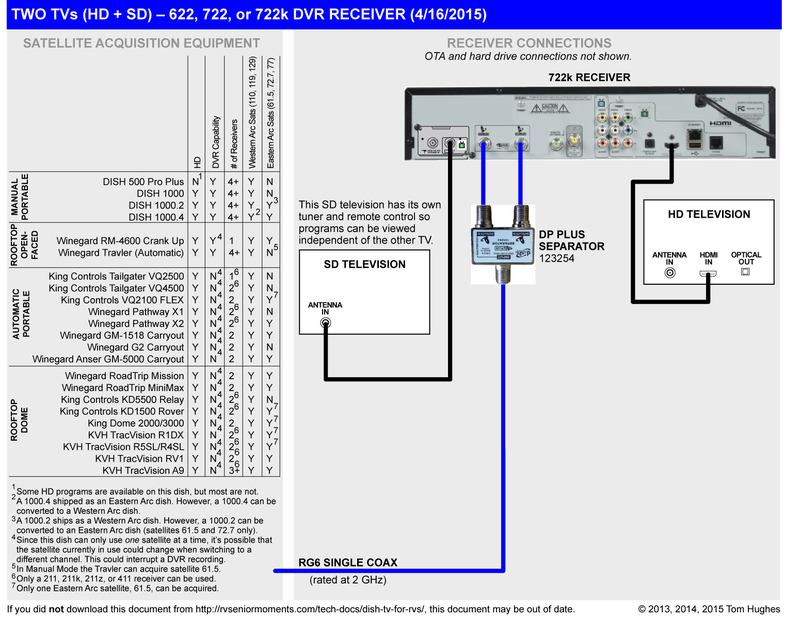 Am I limited to just one DVR with the RTT-40B? I called Winegard and they said it should work, if I can see a signal, then I should be able to DVR it. The only problem I can think of with two VIP211s on one dome is that both receivers must access the SAME satellite — 110, 119, or 129. For example, if VIP211 #1 is recording a show that’s on sat 129, then VIP211 #2 can’t record a program that’s on sat 110 or 119. Thanks, Tom. That would be okay, but I can’t even get the second dvr to work. 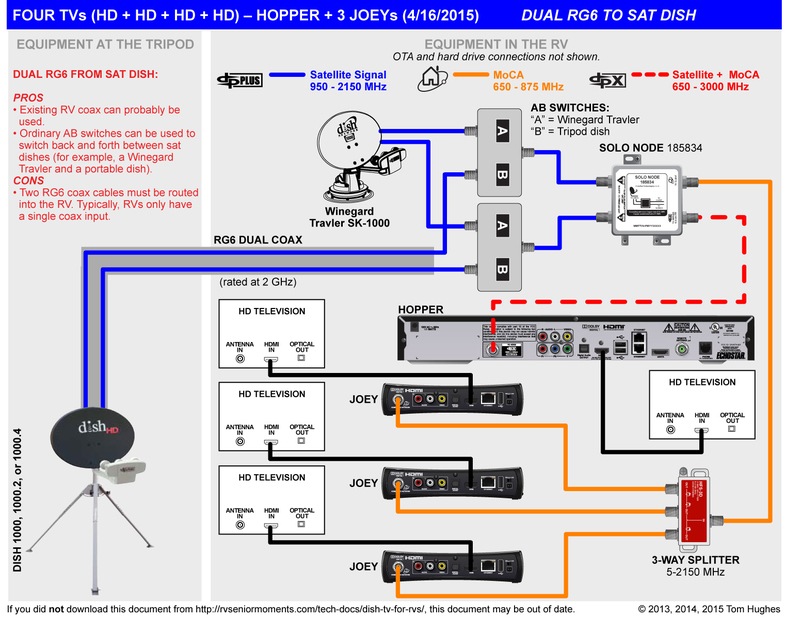 What sat dish are you using? Check your coax wiring. The back TV will only be able to display a signal from the 211z OR your batwing antenna. If you use DISH’s USB OTA tuner, your front TV should be able to display sat AND OTA programs. One update to this thread. 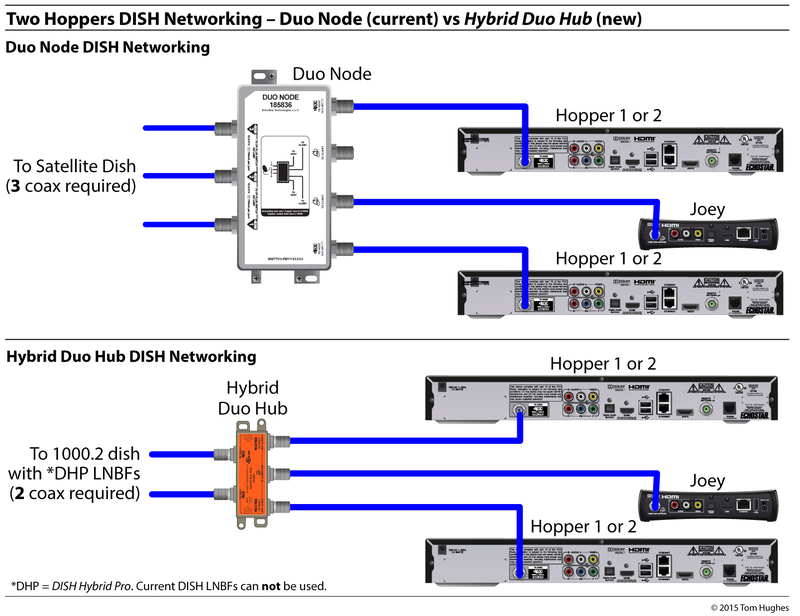 Dish says they will allow only 1 Hopper 3 on a system with the new LNBF and Node that were launched in December, 2015. 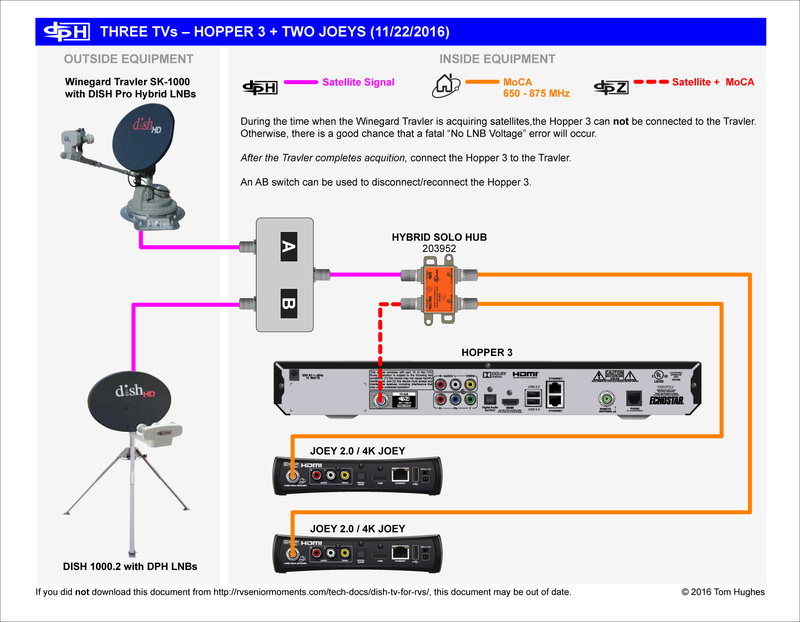 Want to get Dish for my house with a Hopper 3 4K and 2 wireless Joeys. My RV will be delivered in June with a Winegard Travl’r set up for Dish as well as an in motion dome. The RV will have 4 TVs total. 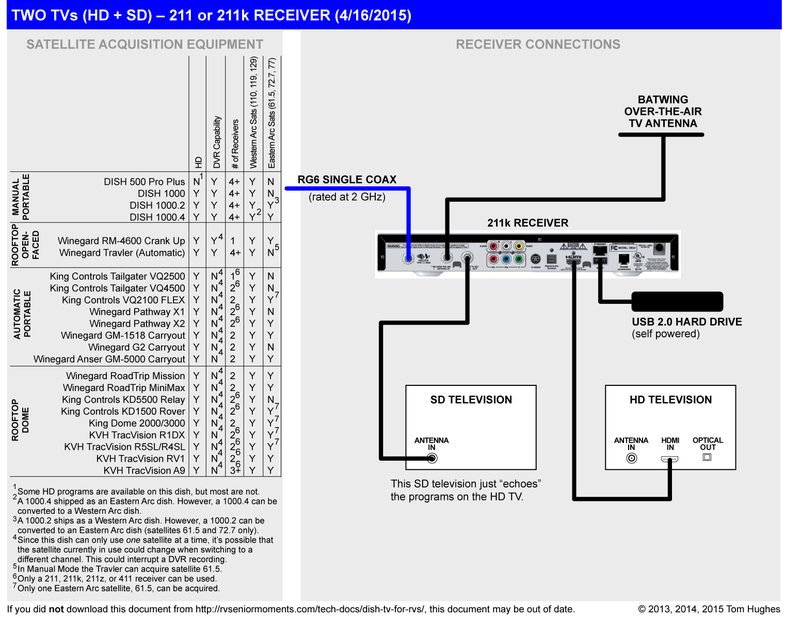 If I purchase 2 211Z receivers and an external DVR at a fee of 7.00 per receiver will I be able to have service in the RV without moving any equip from my house? Want to keep things simple and do not mind the fee. If you just use the 211s in your RV and not the Hopper 3, everything should be fine. 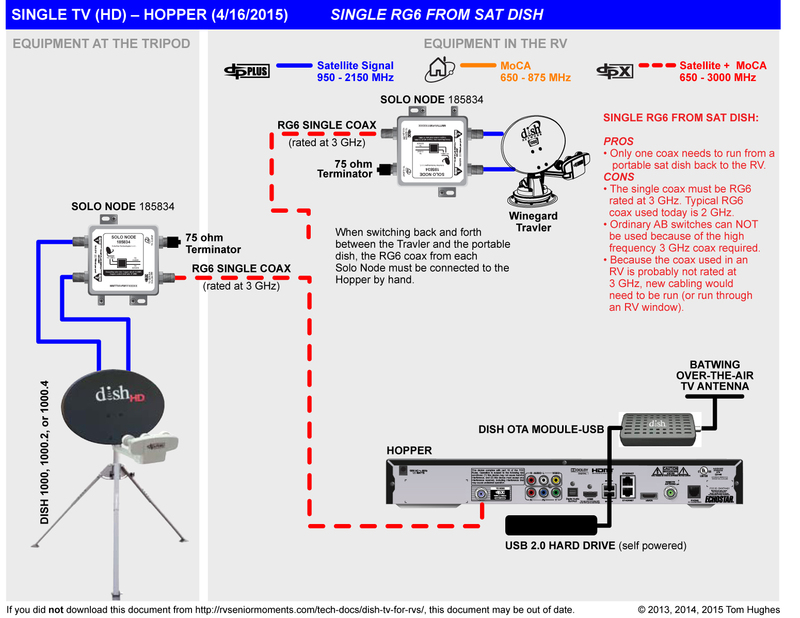 Got new EA DPH for my RV along with the Hopper 3 and 1000.2 dish from Solid Signal. What bird to I used to peak the sat signal? 61.5 or 72.7? No instructions. I think you peak on 72.7. Thanks for the reply. That is right. Just after I asked the question a Dish Installer showed up at my neighbor’s house, so I went over and ask him. He said peak on 72.7, then check 61.5. May have to play with elevation slightly to peak it, but nothing else. Maybe this will be of some help to other folks. I hope so. I have been reading and researching for months and get very conflicting information and none of it seems to be clear on the ability to watch one channel while recording on other channel(S). JoAnn, you have a beer budget and champagne taste going. With a Winegard Pathway X2 and two, DISH 211 receivers (with an attached hard drive on each), you can record a show on one 211 while watching another show on the other 211. Keep in mind that both 211s must be “watching” the same DISH sat. What you really want is a rooftop Winegard Travler ($1200) and a DISH Hopper DVR with a Joey. Thank you for your response. Could a manual 1000.4 with a hopper and a joey do the job? And would we be able to record more than one show while watching another? I set up my sk-1000 and the Hopper3 according to your directions, many thanks for that, I have one problem. When I power the Winegard up it does its search but never locks. It worked fine before I added the Hopper. Any ideas? It could be many things . . . Thanks for the reply. Got to be 3/4 I’ll just have to be more patient. Hope you two are doing well. As I stated earlier I am about to install the Hybird LNB, etc on our Traveler. We’re switching from the old Hopper with Sling to our new Hopper 3, a 4K joey and two wireless Joeys, which we’ve had installed for a few months in our home. My question is. My coach is parked where I can not lock onto a signal. Your instructions say to allow it to lock before I switch out the LNB, etc. However, can I remove power to the Traveler while it is searching, install the new components and stow it? Will that cause an issue? I don’t think it will, and I almost did just that yesterday evening, however, I thought I should double-check with you. Thanks for all you do your site and information have provided us with a great deal of viewing enjoyment, and saved me countless trips to a service center! I’d wait until you get a lock before pulling the plug. OK – I’ll wait till we are parked in a better location. Thanks Tom! Like I said before, there are a number of RVers who have Hoppers in their RVs. The FIRST Hopper install must be done by a DISH installer. Call a local sat installer and work with him. After the initial installation, you can move the Hopper in and out of your RV at your leisure. I purchased the new dual dish tailgator ,and 2 receivers from camping world , so that we could watch TV’s in 2 rooms and watch my programing that I have in my home, But seems if I watch a program in the living area, and try to watch another program in the bedroom, it interrupts the program in the living room. I believe I was miss lead by both dish and camping world sale people not knowing what they are selling, that I could watch two different programs. I was talking to one of the tech that installs the satellites in the homes and he told me that Dish knows they have a product that doesn’t really work very well. and that only way to watch 2 different programs is to use two antennas. 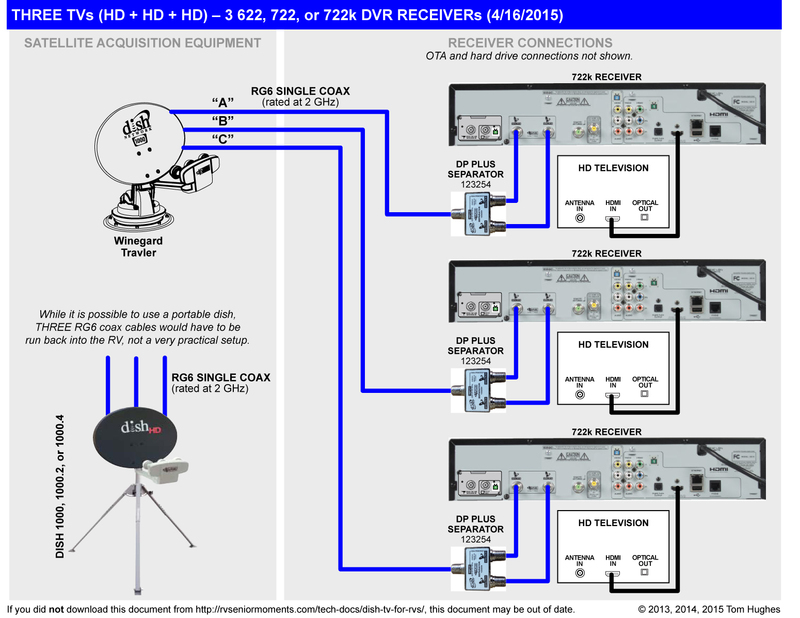 Since DISH programming is dispersed among these three sats, you can run into problems with two, different receivers. If one receiver is watching a program from sat 110, and the second receiver tries watching a program on sat 119 . . . well, you know what happens. You CAN watch different programs on each receiver as long as both programs are on the same satellite. BTW, this is the reason many of us use open-faced portable tripods or the Winegard Travler, because we can then watch any sat we want on any receiver. Had Dish Tech install Hopper 3 in motor home using a drag out aimed at EA. Works great. Ordered the 1000.2 dish, Hybrid LNBF, Solo Hub, and longer arm to install on my old Winegard crank-up on roof of RV. Using a Winegard Satellite Finder SF-1000. Can’t lock onto satellite. Switched every component except the dish between roof top and drag out. Everything works on drag out but not on crank-up. Even ran feed from drag out and connected to feed from roof-top LNBF to check all coax and solo hub. Worked great. Using just roof-top equipment, no signal. Could it be wrong dish? Will this make that much difference? How can I identify correct dish? Any suggestions? Thank you. A rooftop crank up might be ok for aiming a single LNBF, but I would think it’s next to impossible to aim a three-LNBF like you’re trying to do. Buy a ground tripod and put a Hybrid LNBF on it. I am using a Hybrid LNBF and here the skew is 90 which is none. I will work how to adjust the skew later. Seems like I should be able to see one satellite like 72.7. What am I missing? With multi-LNBF, the dish must first be absolutely level — I’m guessing that your rooftop unit is NOT level. Also, the skew must be set before you start aiming. Again, I don’t think that your rooftop setup will work. I’m getting ready to install a TRAV’LER DISH 1000 with hopper + joey. I have a hopper + superjoey + 2 wireless joey in the home. Can I install an access point and wireless joey in my RV? I see in the wireless joey diagram it says only one access point per account. What does this mean? 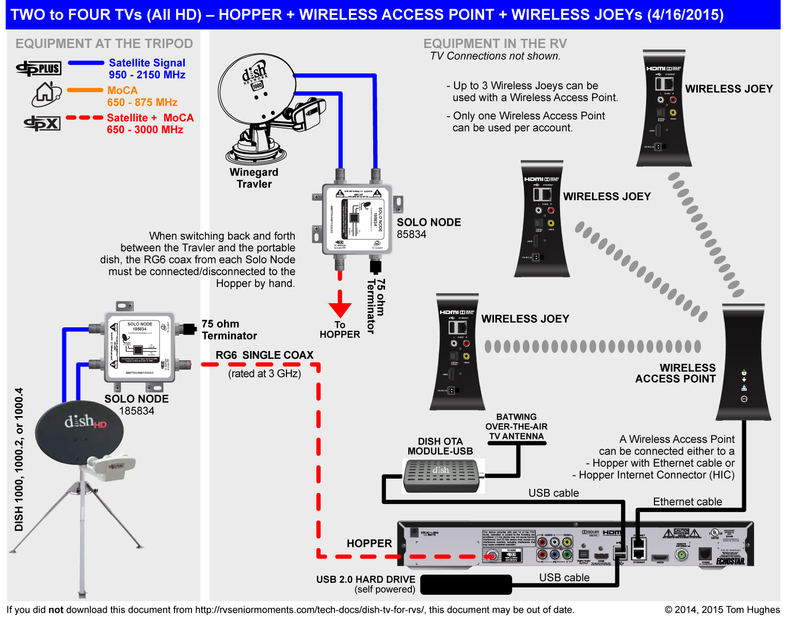 You should be able to move your Hopper, WAP, and wireless Joey to your RV. You can only have one WAP per account so you have to move the one in your house to your RV. Hi Tom, I have been admiring your expertise for several months but have been unable to emulate your success. 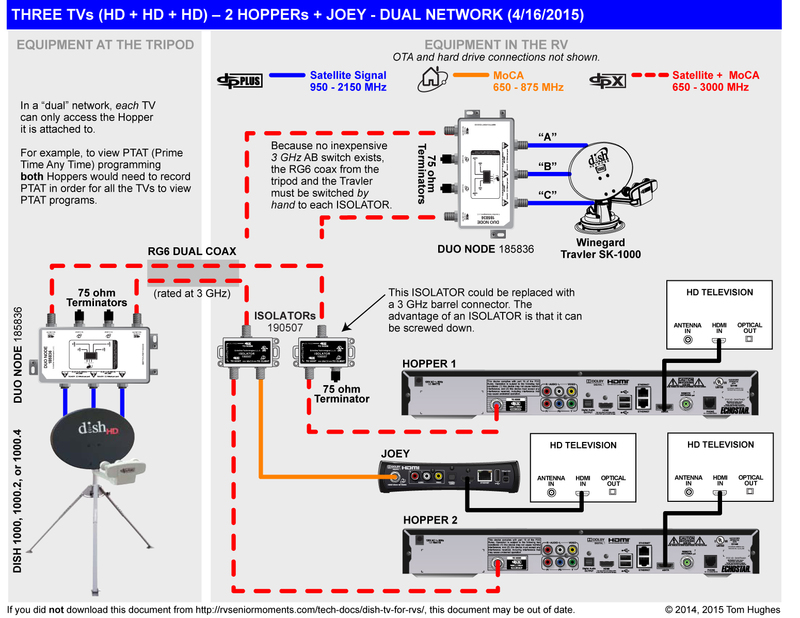 I have an SK1000, Hopper 1 w/Joey and Solo Node and can not get the Joey to work. 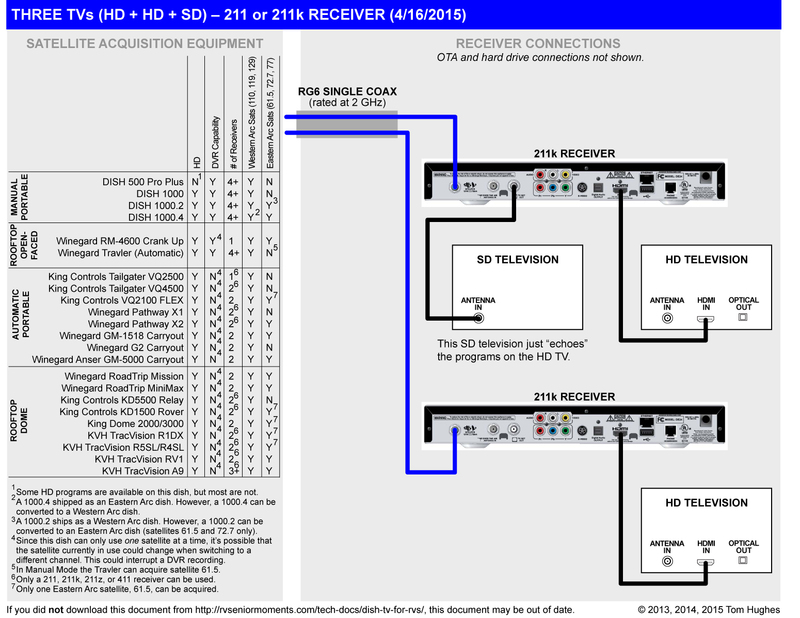 I get HD reception on TV 1 via coax from antenna port A to port 1 on Solo Node. 19 volts at port 1, zero at port 2 on Solo Node. Tuner 3 not working, maybe not Tuner 2 either. No apparent signal from antenna port B when connected to either port on Solo Node. Have used external direct coax from antenna to Solo Node to eliminate possible coax problems. It would help if you had a drawing of your install. Without that, I’m guessing . . . bad Solo Node maybe? I replaced my first Solo Node with another, thinking it was bad and not knowing how to test it (other than voltage check). Same results: No Joey and no Tuner 3. 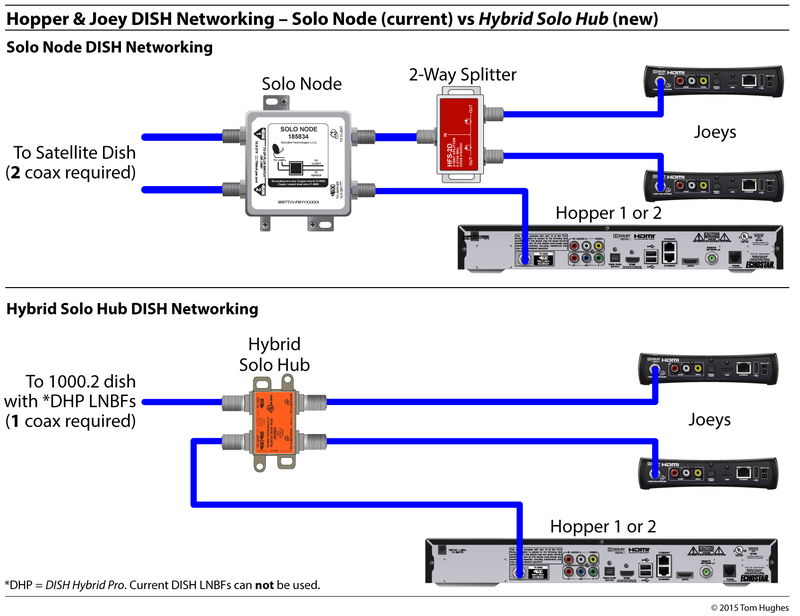 A few days ago I tested the Hopper/Joey by connecting them to a stationary dish wired via a Hybrid Solo Hub, and everything works. So the problem would appear to be SK1000. My husband just installed the Winegard SK-1000 TRAV’LER Gray/Black DISH Multi-Satellite TV Antenna on our 5th wheel today. No problem with the dish install. We are using the hopper sling but can only get a few stations to tune in. We have no problems with the music stations but only a few of the regular stations tune in. Not sure what we are doing wrong. We are planning to possibly install two joys. Any hints on what we might be doing wrong to get the receiver to work. The dish is showing it is contacting satellite 110, 119 and 120. We can’t find anyone local to help with this problem. Would appreciate any help you can give us. Thanks! Did you do a Check Switch? I went to the setup on the receiver but if I did it I do not know can you tell me where on the menu I look for doing the check switch? You’ll have to contact DISH. I’m not familiar with Hopper w/Slings anymore. I recently completed my traveler upgrade for the hopper3. After I finished the upgrade I hooked the traveler to my Dish 722 receiver, it worked perfectly without the solo hub. I then had the dish tech out to install my hopper3. It also ran great for two days. When we tried to reset it, it would startup and after refreshing the screen would go black. The dish tech came that day and replaced the hopper3 but took out my AB switch saying that was probably the problem. Have you had any problems with your AB switch? I think it was just a bad hopper3 and would like to put it back in. Do you have any input? Also, I was reluctant to store the traveler and then reposition it before the Dish tech came out to install the hopper3. Am I correct in thinking if it doesn’t pick up the sattilites after storing that I need to switch the two nonsignal coaxes on traveler? Thank you. I’m confused. You upgraded your Travler to a Hybrid LNB for your Hopper 3. Yet you also have a VIP722 receiver — how did you swing that? I didn’t think DISH allowed that. Also, what are the “two nonsignal coaxes”? Finally, it worked and then it didn’t work after two days? What did you do? Sorry, but the fact that you connected a VIP722 to a Hybrid LNB makes me suspect that you did something else wrong. The only thing I didn’t do was install the solo hub. We watched tv on the 722 until the tech came to install the hopper3 which was three days. No problems. The tech hooked up the hopper3 with the AB switch and solo hub in the the line. We had a great signal from all three sattilites and worked perfectly. After basically two days we could not get the hopper3 to work. The tech came over with a new hopper3 and when he saw the AB splitter in the line he took it out and ran the line right to the solo hub and the the new hopper3. He could check the signal on the old hopper3 and saw that we still had a great signal from all three sattilites so he put in the new one. And, after the long setup process it worked and works great. The tech told me to leave the AB switch out of the line. Not a big problem as I can easily reach the connector to disconnect for positioning the traveler. My question was, do you still use your AB switch in the line and if so are you having any problems? Also, since I didn’t reposition the traveler after installing the hybrid LNBF, if when I do test it and it won’t pick up the sattilites all I have to do is switch the coaxes between B and C on the turret to correct the situation. I know I have port A connected right cause we have a good signal. You’re right, the tech took the 722 with him when he left after the installation of the hopper3. They don’t allow you to have both. I just wanted you to know the hybrid LNBF will work with the 723 without the solo hub in the line. 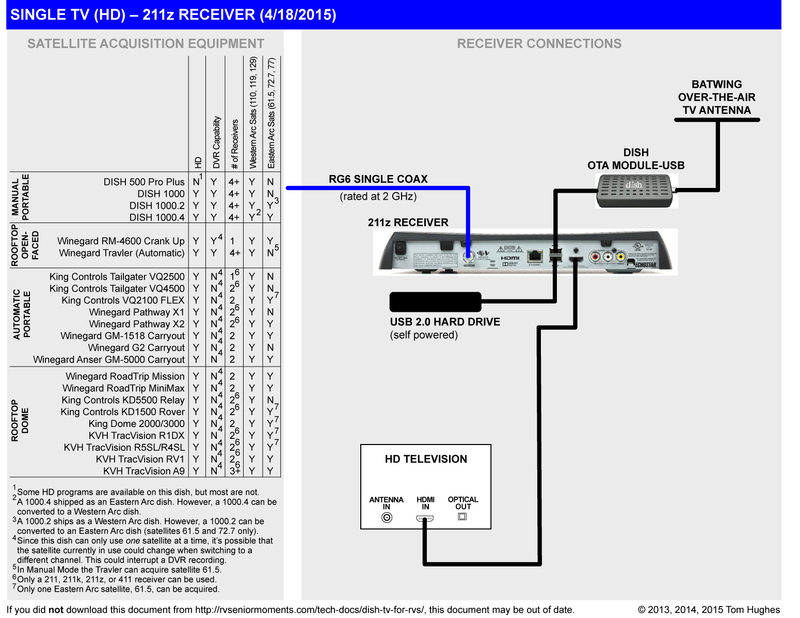 We have 2 211z receivers with a winegard Pathways x2 antenna. In looking through these documents, it looks like we can get the hopper system with a joey. Is that correct? That is what we had at our house bedore we started fulltiming and it was so much better. If that system is available, I will look theough the docs more closely and see if I can do it. Thanks so much for all the great info you provide regarding satellite tv and parks. You can get a Hopper + 211s, but the Hopper won’t work with your Pathway X2. 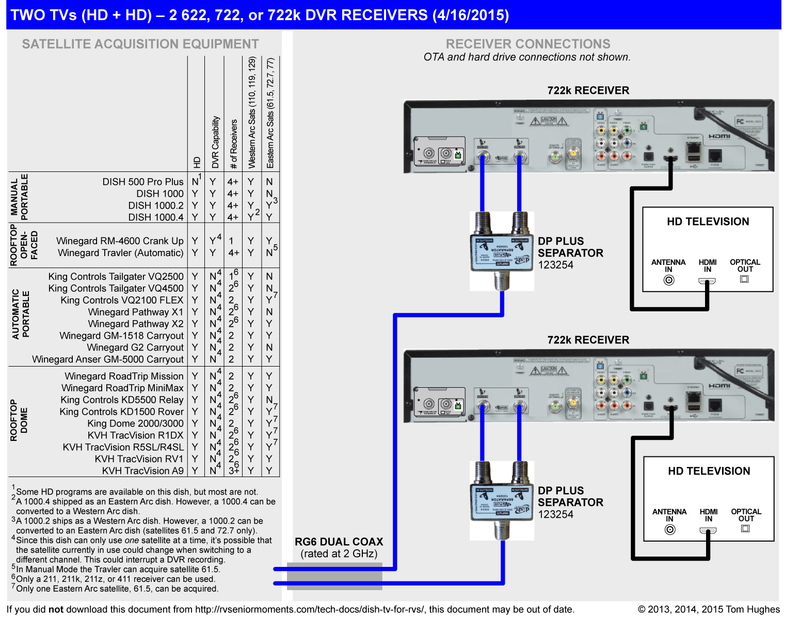 I have two VIP722K receivers with about eight SD TVs sharing the two SD outputs from the VIP722K. It works great. Just using standard TV splitters and get a good signal of all TVs. I run HD TVs on the both receivers. I’d like to upgrade to a Hopper 3 and maybe one or two Joeys. Problem is there is no coax output to run to the SD tvs. Spent an hour on the phone tonight with DISH (sounded like he was in India) and he said I couldn’t mix a 722 with a Hopper. He said I could hook the SD tvs directly to the DISH antenna and they could mirror one more of the HD signals from the Hopper or Joey. I’ve gone through all your diagrams, but don’t see how to hook up this combination. 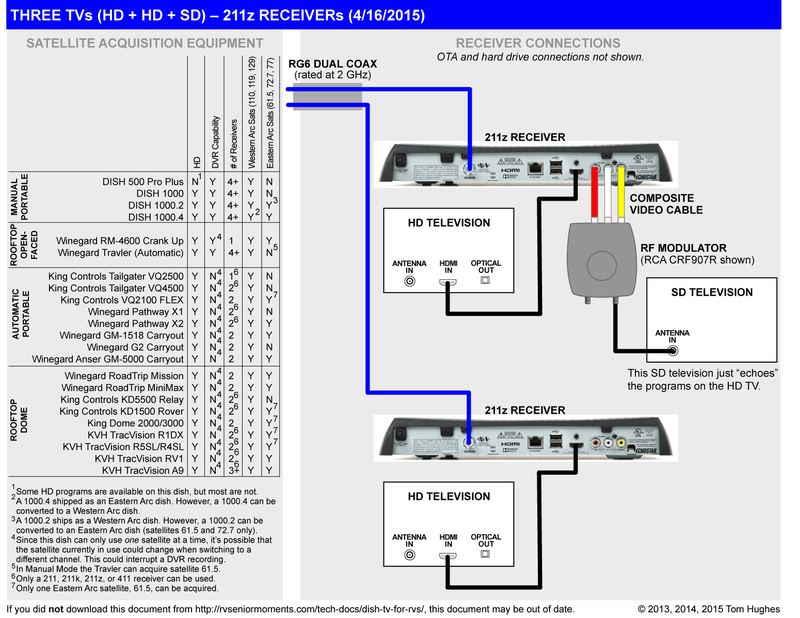 I’d like to be able to keep my SD tvs connected via their COAX input. Any suggestions. I almost upgraded to Direct TV, but have decided to stay with DISH a little longer, as I think they have a better system, although more expensive for me (after having my system for nine years). It’s tempting to switch and get the introductory pricing and then to switch back when the price jumps. Sad they don’t help their long-time customers with price breaks. Thanks for this site! It is great. I’m having my Directv rooftop dish converted to a DISH Network compatible dish as I write this. Also having a Hopper and two Joey’s installed. They are also putting setting me up with an external tripod-mounted dish antenna. I’ve seen a lot of the tripod dishes in RV parks and I mentioned to the installer that I have really been wanting one. I told him that everyone had told me that they had it down to about five minutes to set it up. When I said this, he said “But do they have Hoppers?”. I didn’t know. The installer says that external tripod-mounted dishes are difficult to set up with a Hopper because they’re more sensitive. He recommended that, whenever I want to set it up, I call a professional installer to do it. WHAT??? I’ve been a computer scientist for 30 years, and have confidence that I can do this myself. But I’d like to know what you think about the level of difficulty. I’ve got the stuff to help me make sure that the tripod is level, and a bought a digital satellite finder (my installer said to throw it way because they’re worthless). Thoughts? Any specific tips and/or equipment I should have to help me point the external dish? Yes, a DISH tripod can be a PITA to set up. I’ve been doing it for over a decade, and it’s still a pain. However, I made my life considerably easier when I bought a Super Buddy 29 sat meter: used Super Buddy 29. It’s an expensive meter, but it makes DISH setup a snap. The manufacturer of the Super Buddy 29 has replaced it with the XR-3, a more expensive meter of course, but there are still used 29’s out there to be had. Finally, are you having a “plain” Hopper with Sling installed or a Hopper 3? I installed the hopper3 per your instructions and schematics. I couldn’t be happier. When the technician came and installed the hopper3 he wouldn’t do I with the AB switch in the line. After he left I put it back in. Its been operating flawlessly ever since. No problems deploying the dish. The only problem I’ve ben having is the wireless joey keeps dropping the signal from the wap. Any suggestions? I think I’ll put a wired Joey in when I get back up north and see how that works. Also wondering if you’ve run into any problems with your setup. Really appreciate your instructions. 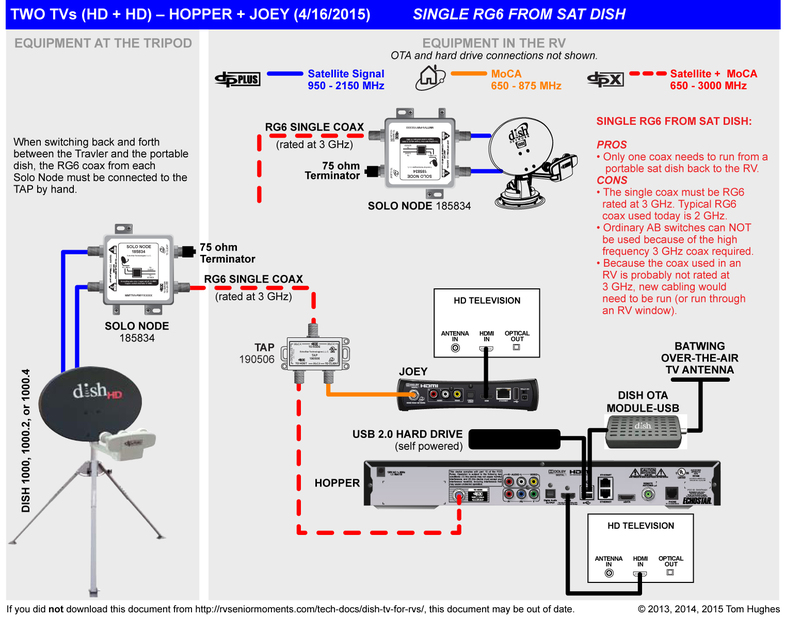 Sorry, wireless Hopper/Joey is not my forte — try posting on one of the RV forums like Escapees. The only intermittent problem I’ve run into with my Hopper 3/Winegard Travler install is what I call the Crazy Ivan. For a Crazy Ivan? Shut off the Travler, try again, or use a tripod. Crazy Ivan happened the first time tried to deploy the dish, but it hasn’t happened since. I think probably 6 times. Hopefully you can help me or point me in right direction. I have a 2012Canyon Star. Previous owner had it set up with Direct TV to a small domed sat on the roof. He had 2 receivers (1 for living area TV, 1 for bedroom TV). The winegard sat on the roof is the type that can be switched from Direct to DISH by changing the switches. Previous owner took his receivers but left everything else in tack. I am single full timer and don’t watch tv in bed. Can you tell me what type receiver I should get to plug into this system so I could get pay as you go sat tv for when traveling. My winter place has cable tv and internet so I wouldn’t use the sat during those months. I wouldn’t mind being able to record a show for later asks for any help. First, you need to find out what model of dome you have. Sorry, I have a Winegard RoadTrip Automatic Satellite TV Antenna. It supports one dual or two single receivers. I found this article on the internet but don’t see it in your lists on the web site? I did the Direct to the Dish DPP swap. Just went round & round with Dish about the Hopper & Wingard Dish. 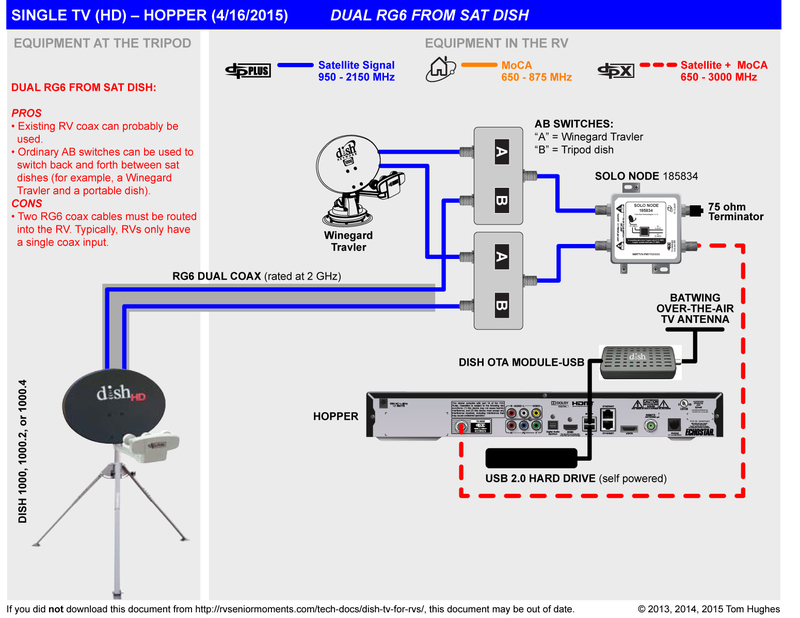 Dish Outdoor won’t sell the Hopper to me in an RV. Finally got it out of them that I could buy it where ever and then just activate it through Dish Outdoor. My question is: can I wireless network the Joey’s or do they have to be MoCA? Nope. They can be connected via wireless. If you have dish in your house you can a receiver from there to use. If not you will have to buy one. I bought an RV 2 years ago that has an In-motion satellite on the roof and a Dish receiver in a cabinet next to the TV. I have no idea what I need to do to get these things running. I’ve been using the RV’s tv antenna til now. Can you give me an idea of what I need to do, or who I need to contact, or what questions I need to ask in order to get the thing working, please? hi i am a dish Tech what promblem are you haveing …..details are important…. I have recently resolved the winegard and hopper 3 issues…ill do my best to help. 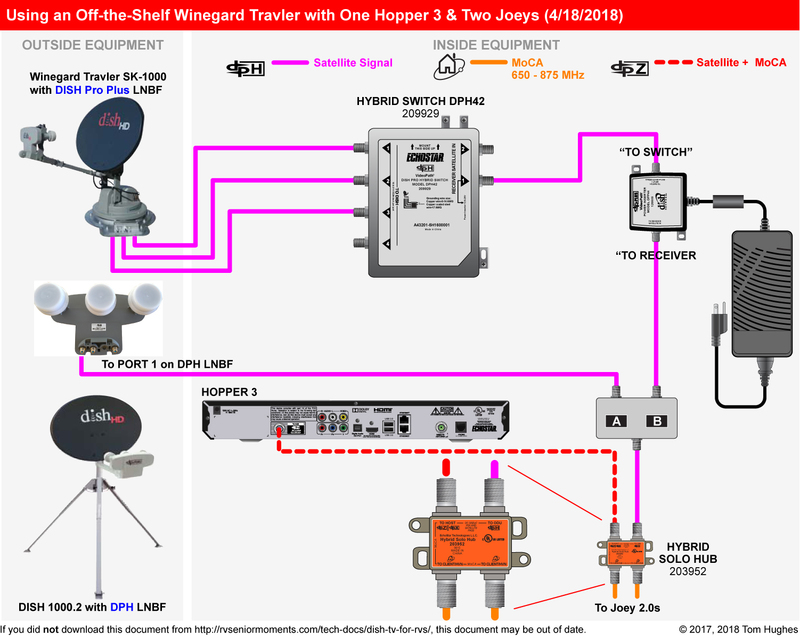 Tom, Before the new DPH42 switch was released, I installed a new Winegard Trav’ler on my coach with a Hopper 3 and 4k Joey using a DPH LNB, and the A/B switch according to your detailed instructions. It has worked perfectly from the first time I powered everything up over 1 year ago. No one said I could do this. You proved everyone wrong. Thank you! Is there any possibility to be able to use the Tailgater with a Hopper 3? Tom, I am building a Tiffin Allegro Bus 40 AP. It is currently scheduled to have 4tvs, all dedicated to the same channel, with each tv connected via one coax to a dish dvr in the bedroom. I want to do dish, pay as you go, being able to access a different channel on each tv ( although I doubt I will use the external tv much, if at all). The local Winegard rep in Red Bay, AL recommended I get a hopper2 w/sling plus I need the “on the roof” travelers dish and I guess a couple joeys (wireless?). He said, just as a precaution I should run a second coax cable from each tv back to the bedroom. 1. Does this setup sound right to you, any specifics I am missing? 2. Can I do the pay as you go option with this setup? 3. Should I invest in a portable dish, in addition, when I am camped out under trees, or do I lose my ability to access more than one channel at a Time? Question #2: No, I don’t believe DISH allows Hoppers on Pay-As-You-Go plans. If you must have Pay As You Go, then you can run a maximum of three Wallys (or 211’s) from your rooftop Winegard Travler SK-1000. But, seriously, a new RV with three Wallys? Yuch. Question #1 (I’m assuming you’ll opt for a Hopper regardless of whether you’re on Pay As You Go): Nope, go with a 16-tuner Hopper 3. 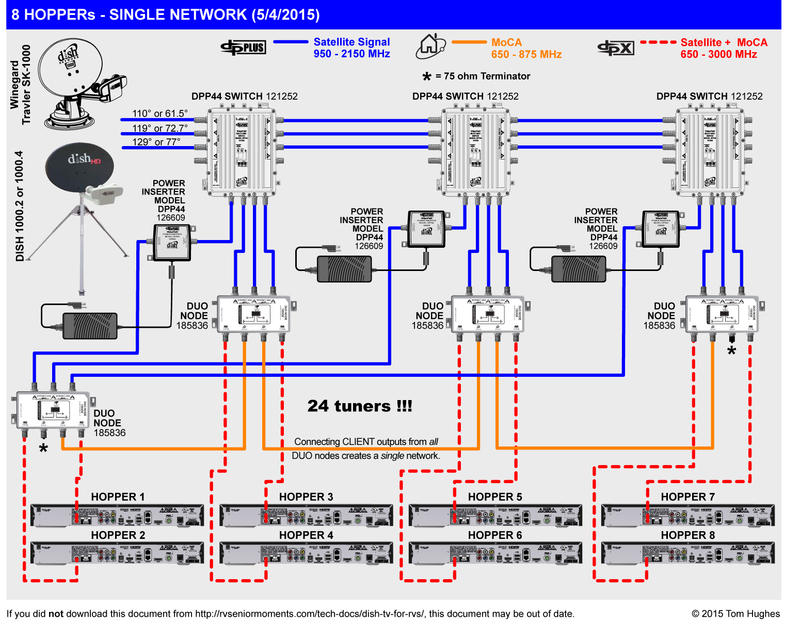 It’s much faster than a Hopper 2, and you’ll need more than 3 tuners (in a Hopper 2) for those 4 TVs. The Winegard rep will probably say that they still do not have a Hopper 3 “solution”. If so, just tell them that several folks I personally know have been using a Hopper 3 with a Winegard Travler for months — and it works fine as long as you use a DPH42 switch. True, before the DPH42 switch was available, using a Hopper 3 with a Traveler could be problematic. Look up “Crazy Ivans” on my web site. Also, you’ll have to have ALL THREE coax connections (besides the power cable) from the Travler run into your RV. Question #3: Yes, get a portable dish. 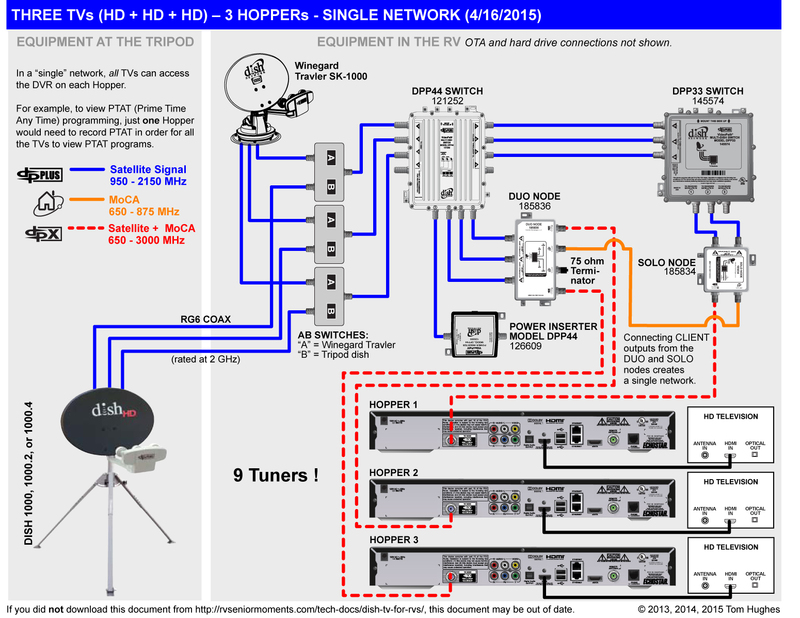 If you opt for a Hopper 3, get a 1000.2 dish and buy a Western Arc and an Eastern Arc LNBF. Thank you Tom, I will take this schematic to my Winegard guy. 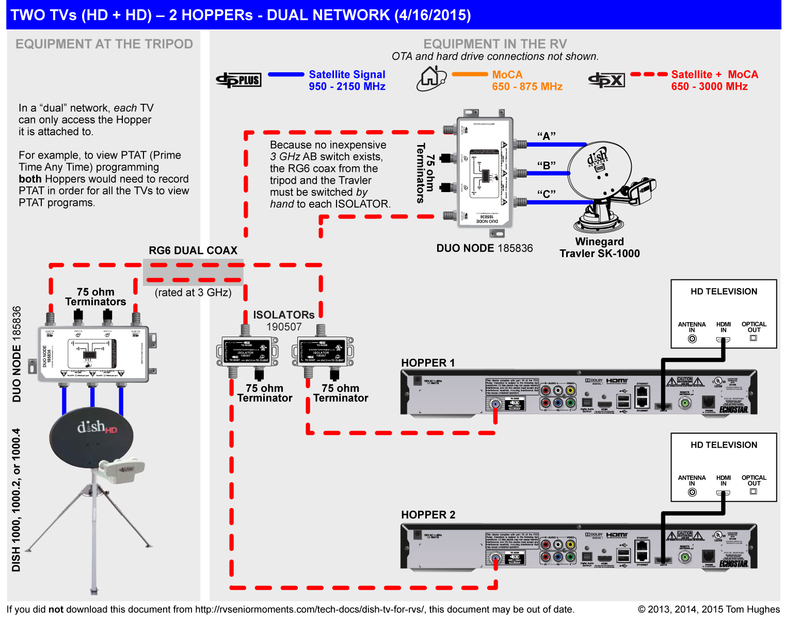 If I understand correctly, the three lines from the traveler to the hybrid switch would eliminate any need for a second coax from DVD to each tv? If, in order to do pay as you go I wind up with 3 wallys, would the second coax be helpful, or do they have wireless wallys? DVD to TV? You mean a Blu Ray DVD or what? I don’t understand. No, Wallys need to be connected to a sat dish via coax. ALWAYS run all three coax lines from a Travler into the RV — even if you don’t use all three. can do pay as you go with any equipment, as long as you own the equipment. Still have a $7/mo charge for receiver 2 and 3. First, a Winegard Travler does NOT connect to any Bluetooth disk player. Second, you know that you have to convert your DirecTV Travler to a DISH Travler, right? You can’t hook up a Hopper to a DirecTV Travler. The conversion can be done for a few hundred dollars. 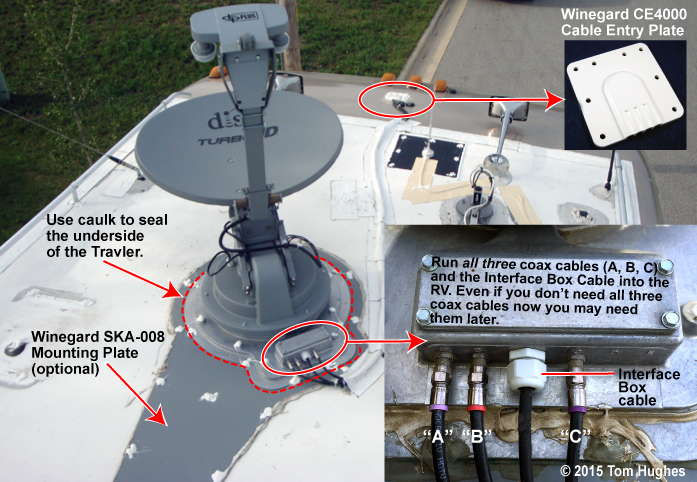 Third, once you complete the DirectTV-to-DISH Travler conversion, I suggest you run ALL THREE coax lines into your RV. (Actually, you would run 4 line in — 3 coax + the control box cord.) You may not need all three right away, but you may later. Next, you can connect your Hopper 2 to your Travler using either 1 or 2 coax lines from the Travler. Tom, in your schematic to Wally above, there is a power cord attached to a “dish” piece of equipment, one output to the dph42 switch and one output to the a/b switch. 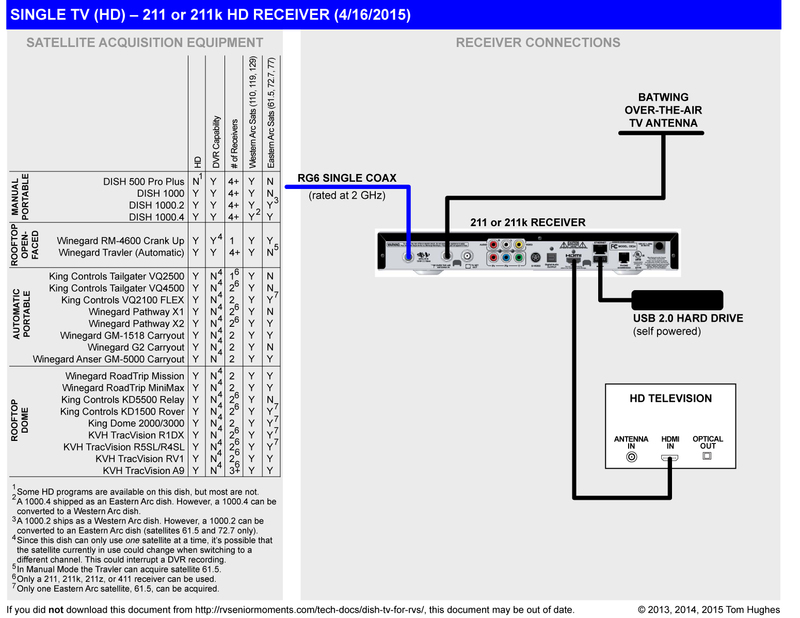 Does that “dish” labeled equipment come with the dph42 switch, the sk 1000 dish or is it something seperate I have to get? Yes, that’s the DPH42 power supply. Tom…I own a 09 Monaco Camelot with a DirectTV Traveler that I have never attempted to use because we are DISH at home and not about to switch. 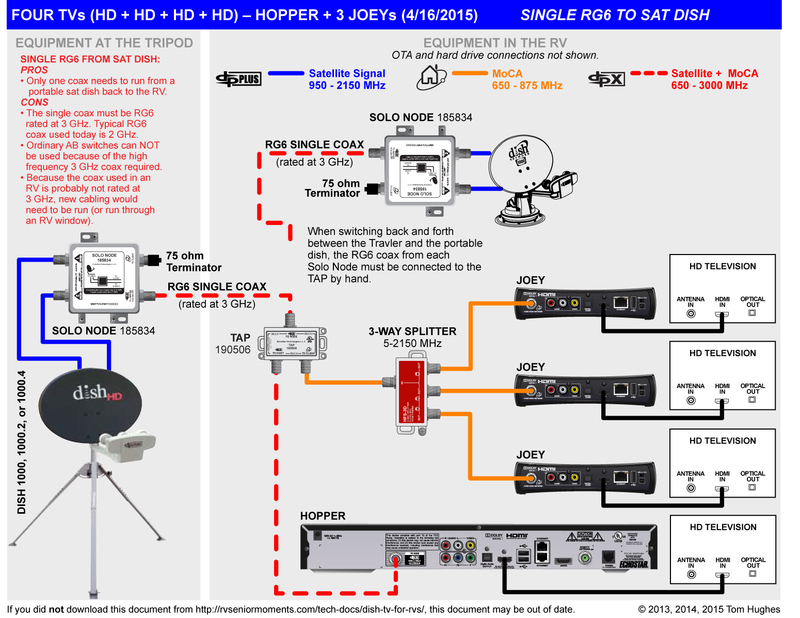 I would like to convert the coach to DISH using our Hopper3 & Wireless Joey(s) solution that we use at our home (same equipment). Here is the question…assuming I can get the Traveler dish converted will it work with both eastern & western arc satellites? We travel from coast-to-coast during the summer & I really don’t want to have to swap LNB’s when we go from Arizona to Maine. Seeing as I am afraid of heights, is there a permanent one-size-fits-all solution? A DISH Winegard Travler only works with the DISH Western Arc sats (110, 119, 129) which should work most of the times unless you’re parked under trees. To get the Eastern Arc sats you’ll have to do what the rest of us do — buy a tripod-mounted dish like the 1000.2 which has both Western & Eastern Arc options.